The current invention provides for methods and medicaments that apply an oligonucleotide comprising aninosine and/or an uracile and/or a nucleotide containing a base able to form a wobble base pair, said oligonucleotide being preferably RNAse H substantially independent and being complementary only to a repetitive sequence in a human gene transcript, for the manufacture of a medicament for the diagnosis, treatment or prevention of a cis-element repeat instability associated genetic disorders in humans. The invention hence provides a method of treatment for cis-element repeat instability associated genetic disorders. The invention also pertains to a modified oligonucleotide which can be applied in a method of the invention to prevent the accumulation and/or translation of repeat expanded transcripts in cells. 本发明涉及医学领域，具体涉及与在编码或非编码序列有不稳定重复的基因相关的遗传病症的治疗，最具体而言是导致人类亨廷顿病的HD基因或导致强直性肌营养不良1 型的DMPK基因中的不稳定重复。  The present invention relates to the field of medicine, and in particular relates to coding or non-coding sequence repeat instability genetic disorders associated with a gene therapy, most specifically the cause of human Huntington's disease or HD gene cause myotonic dystrophy unstable repeat DMPK gene type 1. 基因特异微卫星和小卫星重复序列的不稳定性，导致随体中重复序列长度的增加，与35种人的遗传病症相关。  The gene-specific microsatellite and minisatellite repeat sequence instability, resulting in increased satellite repeat sequence length associated with the 35 kinds of human genetic disorder. 例如发现基因中三核苷酸重复不稳定性导致X连接脊髓和延髓性肌萎缩（SBMA)、强直性肌营养不良1型（DM1)、脆性X综合征（FRAX基因A、E、F)、亨廷顿病（HD)和数种脊髓小脑共济失调（SCA基因家族）。 Such as that found in a gene lead to instability of trinucleotide repeats X connecting spinal and bulbar muscular atrophy (SBMA), myotonic dystrophy type 1 (DM1), fragile X syndrome (FRAX genes A, E, F), Huntington's disease (HD) and several spinocerebellar ataxia (SCA gene family). 不稳定重复发现于基因例如亨廷顿病基因的编码区域，因此所述疾病的表型是由蛋白质功能和/或蛋白质折叠的改变引起的。 Unstable repeats are found in the coding region of a gene, for example, Huntington's disease gene, whereby said phenotype is a disease of protein function and / or alter protein folding caused. 不稳定重复单元也发现于非翻译区域，例如强直性肌营养不良1型中，发现于3'UTR或内含子序列，例如强直性肌营养不良2型中。 Unstable repeat units are also found in untranslated regions, such as myotonic dystrophy type 1, or intron sequences found in the 3'UTR, e.g. myotonic dystrophy type 2. 对于DMPK重复的正常数目为约5-37，但是在前突变和完全发病状态增加到2-10倍或更多，至50、100并且有时1000或更多重复单元。 For normal DMPK repeating number of about 5-37, but the front and full mutation status increased incidence of 2-10 times or more, to 50, 100 and sometimes 1000 or more repeat units. 对于DM2/ZNF9 ±曾力口至10，000 或更多重复(Cleary 禾口Pearson，Cytogenet. Genome Res. 100 ： 25-55,2003)。 For DM2 / ZNF9 ± port has force to 10,000 or more repeats (Cleary Wo port Pearson, Cytogenet Genome Res 100:.. 25-55,2003). 亨廷顿病的致病基因，HD，位于4号染色体。  The causative gene for Huntington's disease, HD, is located on chromosome 4. 亨廷顿病以常染色体显性方式遗传。 Huntington's disease inherited in an autosomal dominant manner. 当所述基因拥有超过35个编码聚谷氨酰胺延伸的CAG三核苷酸重复时，重复的数目可以在连续世代扩增。 When the gene has more than 35 when encoding trinucleotide repeats, the number of repeats can be amplified CAG polyglutamine extending in successive generations. 由于重复长度的累进增加，所述疾病在连续世代中趋向严重性增加和在更早年龄出现，此过程称为早现（anticipation)。 Because of the progressive increase in length of the repeats, the disease tends to increase in severity and successive generations occurs at an earlier age, a process called anticipation (anticipation). HD基因的产物是348kDa的细胞质蛋白亨廷顿蛋白（himtingtin)。 The product of the HD gene is a cytoplasmic protein huntingtin protein 348kDa (himtingtin). 亨廷顿蛋白在正常形式具有少于40个谷氨酰胺氨基酸残基的特征序列；导致疾病的突变亨廷顿蛋白有超过40个残基。 Huntingtin has a characteristic sequence of fewer than 40 glutamine amino acid residues in the normal form; disease-causing mutant huntingtin protein with more than 40 residues. 在神经细胞中突变亨廷顿蛋白分子的持续表达导致形成最终引起细胞死亡的大块蛋白质沉积，尤其是在额叶和基底神经节(主要在尾状核）。 Sustained expression of mutant huntingtin molecules in neuronal cells results in the formation of large protein deposits ultimately cause cell death, particularly in the frontal lobe and the basal ganglia (mainly in the caudate nucleus). 所述疾病的严重性通常与额外的残基的数目成比例。 The severity of the disease is generally proportional to the number of extra residues. DMl是成人中最常见的肌营养不良症并且是遗传的、累进的、退行性多系统病症， 主要累及骨骼肌、心脏和脑。  DMl is the most common adult muscular dystrophy and is hereditary, progressive, degenerative multi-system disease, mainly involving the skeletal muscle, heart and brain. DMl是由位于人染色体19q的DMPK基因（强直性肌营养不良蛋白激酶）的3'非翻译区域中不稳定三核苷酸（CTG)n重复的扩增导致的（Brook et al, Cell, 1992)。 DMl is located on human chromosome 19q of the DMPK gene (myotonic dystrophy protein kinase) 3 'untranslated region of unstable trinucleotide (CTG) n repeat amplification result (Brook et al, Cell, 1992 ). 强直性肌营养不良2型（DM2)是由ZNF9基因的内含子1中CCTG的扩增导致的（Liquori et al, Science 2001)。 Type myotonic dystrophy (DM2) 2 is amplified in the CCTG intron 1 ZNF9 gene caused (Liquori et al, Science 2001). 对于强直性肌营养不良1型，DMPK转录本的核-胞质输出由重复的增加的长度所阻断，所述重复形成在核灶（nuclear foci)积聚的发夹状二级结构。 For myotonic dystrophy type 1, the nuclear DMPK transcript - cytosolic blocked by the repeated output increased length, formed in the repeat hairpin secondary structure nuclear foci (nuclear foci) accumulation. 携带长（CUG)n区的DMPK转录本可以形成发夹状结构，所述发夹状结构结合盲肌(muscleblind)蛋白家族并且随后聚集在核中的核糖核酸灶。 Carrying long (CUG) n region may be formed DMPK transcript hairpin structure, the hairpin structure incorporates muscle blind (muscleblind) family of proteins and subsequent aggregation RNA foci in the nucleus. 这些核内含物被认为隐蔽盲肌蛋白质和其他可能的因子，然后成为细胞的限制。 These nuclear inclusions are considered hidden blind muscle proteins and possibly other factors, and then become a limiting cells. 在DM2中，携带（CCUG)n扩增重复的ZNF9RNA的积累形成相似的灶。 In DM2, the carrying (CCUG) n repeat amplification accumulation ZNF9RNA formed similar foci. 由于盲肌蛋白是剪接因子，其消耗导致其他转录本剪接中显著的重排。 Since actin is a blind splicing factors, which consumes spliced ​​transcripts lead to other significant rearrangement. 许多基因的转录本因而成为异常剪接的，例如通过包含胎儿外显子、或外显子遗漏产生了无功能蛋白质和导致受损的细胞功能。 This transcription of many genes and thus become aberrantly spliced, for example, by including an outer fetal exons, or produces exon skipping results in nonfunctional proteins and impaired cell function. 上述观察和新发现使人们理解了诸如强直性肌营养不良1型、亨廷顿病等不稳定重复疾病可以通过全部或者至少部分移除导致疾病的异常转录本来治疗。  The above observations and discoveries enable understanding of myotonic dystrophy type 1, Huntington's disease and other diseases such as unstable repeat diseases can lead to abnormal transcription of all or at least partially by treatment have been removed. 对于DM1，在核中积聚的异常转录本可以被下调或完全移除。 For DM1, the abnormal accumulation of transcripts in the nucleus may be completely removed or reduced. 甚至所述异常转录本相对小的减少可以释放大量的和可能充足数量的被隐蔽的细胞因子从而促进恢复DM中正常RNA加工和细胞代谢(Kanadia et al.，PNAS 2006)。 The abnormal transcript even a relatively small reduction and can release large amounts of a sufficient number of possible concealed thereby promoting cytokine DM restore normal RNA processing and cellular metabolism (Kanadia et al., PNAS 2006). 对于HD，减少HD患者细胞中积聚的亨廷顿蛋白沉积物可以改善疾病症状。 For HD, Huntington reduce protein deposits accumulate in HD patient cells can improve the symptoms of the disease. 已经做了一些尝试使用反义核酸、RNA干扰或核酶设计用于不稳定重复疾病强直性肌营养不良1型的治疗方法和药物。  has made some attempts to use antisense nucleic acid, RNA interference or ribozymes designed for unstable repeat disease myotonic dystrophy type 1 treatment methods and drugs. (i) Langlois et al. (Molecular Therapy, Vol. 7 No. 5，2003)设计了能够裂解DMPK mRNA的核酶。  (i) Langlois et al. (Molecular Therapy, Vol. 7 No. 5,2003) designed a ribozyme capable of cleaving DMPK mRNA. 锤头状核酶具有与在DMPK中恰好在CUG重复前面的3' UTR互补的延伸RNA。 Hammerhead ribozymes having a CUG repeats in DMPK just in front of the 3 'UTR extending complementary RNA. 在体内，载体转录核酶能够在被转染的细胞里分别裂解和减少包含扩增CUG重复的mRNA和正常mRNA种类63%和50%。 In vivo, vector transcribed ribozyme cleavage and reduction can each comprising mRNA amplification CUG repeats normal mRNA species and 63% and 50% in the transfected cells. 因此，通过此方法正常转录本也受严重影响，并且带有扩增重复的受累及的mRNA种类并非被特异性靶向。 Thus, by this method the normal transcript is also seriously affected, and the amplification is repeated with mRNA species are involved and are not specifically targeted. (ii)Langlois et al.，(Journal Biological Chemistry, vol280, no.17，2005) 采用了利用RNA干扰的另一种方法。  (ii) Langlois et al., (Journal Biological Chemistry, vol280, no.17,2005) using another method using RNA interference. 慢病毒递送的短发夹RNA(shRNA)被导入到DMl成肌细胞并且被证明可下调核中保留的突变DMPK mRNA。 Lentivirus delivered short hairpin RNA (shRNA) was introduced into DMl myoblasts and demonstrated to be down-regulated mutant DMPK mRNA core retained. 测试了4种shRNA分子，两种与DMPK 的编码区域互补，一种与3' UTR的独特序列互补和一种为有不相干序列的阴性对照。 Four shRNA molecules tested both coding and complementary to a region of the DMPK A and the 3 'UTR and one unique sequence complementary to the sequence we have irrelevant negative control. 前两种shRNA能够下调具有扩增重复的突变DMPK转录本至约50 %，但是更有效地下调细胞质野生型转录本至约30%或更少。 ShRNA can be cut with the first two amplification repeating mutant DMPK transcript to about 50%, but more effectively downregulated cytoplasmic wildtype transcript to about 30% or less. 通过阳离子脂质递送的等量的合成的siRNA是无效的。 Synthetic siRNA delivered by cationic lipids was ineffective equivalent amount. 针对3' UTR序列的shRNA被证实对两种转录本都是无效的。 For shRNA 3 'UTR sequence was confirmed for both transcripts are invalid. 因此，这种方法也不是选择性地靶向扩增的重复mRNA种类。 Thus, this approach is not targeted selectively to repeat mRNA species amplification. (iii)来自Furling et al. (Gene Therapy, Vol. 10，p795_802，2003)的第三种方法使用表达149bp长的反义RNA的重组逆转录病毒在人DMl成肌细胞中抑制DMPK mRNA水平。 A third method of antisense RNA  (iii) from Furling et al. (Gene Therapy, Vol. 10, p795_802,2003) expressing the recombinant retrovirus 149bp long in human DMl myoblasts inhibit DMPK mRNA levels. 逆转录病毒被设计用于向DMl细胞提供与39bp长的（CUG) 13重复和在该重复之后的IlObp区域互补的149bp长的反义RNA以增加特异性。 Retrovirus was designed to provide DMl cells 13 was repeated with 39bp long (CUG) and in the region after repeated IlObp complementary to 149bp long antisense RNA to increase specificity. 与野生型DMPK转录本50%的减少的相比，这种方法导致了突变的（重复扩增的）DMPK转录本80%的减少，以及在被转染的DMl成肌细胞中恢复分化和功能特征。 Compared to the wild type DMPK transcript of 50% reduction, this approach results in a mutated (repeat expanded) DMPK transcript of 80% reduction, and myoblast differentiation and function in the recovery transfected DMl feature. 因此，这种方法也没有选择性靶向扩增的重复mRNA 种类，它取决于非常长的反义RNA并且只能与重组病毒递送技术组合使用。 Thus, this method is not selective targeting repeat mRNA species amplification, which depends on a very long antisense RNA and can only be delivered in combination with recombinant viral technology. 上述方法和技术为与重复不稳定性和/或扩增相关的遗传疾病提供了导致受累的重复扩增的等位基因和未受累的或正常等位基因均非选择性降解的基于核酸的方法。  The methods and techniques repeat instability and / or amplification of genetic diseases associated involvement provide result in repeated and amplified alleles unaffected or normal allele are based on the non-selective degradation the method of nucleic acids. 此外，本领域使用的序列特异于与所述疾病相关的基因但没有提供可应用于数种与重复扩增相关的遗传病症的方法。 Further, specific sequences used in the art to the gene associated with the disease but does not provide a method applicable to several genetic disorders associated with repeat amplification. 最后，本领域只教导了涉及使用重组DNA载体递送系统的方法，所述系统需要适应每个寡核苷酸和靶细胞并且仍然需要进一步优化。 Finally, the art only teaches relates to the use of recombinant DNA vector delivery systems method, the system needs to adapt each oligonucleotide and target cell and still need to be further optimized. 5嘧啶和/或含有能形成摆动碱基对的碱基的核苷的寡核苷酸或核酸分子的用途，所述寡核苷酸基本上不能招募和/激活RNA酶H。 Pyrimidine-5 and / or use of the oligonucleotide containing or capable of forming a nucleic acid molecule nucleoside bases wobble base pair, said oligonucleotide is not substantially recruit and / RNA activating enzyme H.
 不希望被理论限制，本发明可以通过改变未成熟RNA的转录后加工和/或剪接导致转录本水平的减少。  Without wishing to be bound by theory, the present invention can be altered post-transcriptional processing of RNA of immature and / or reduce the spliced ​​transcript level results. 通过可变剪接和/或转录后加工减少转录本水平可以产生缺乏过度扩增的或不稳定的（三）核苷酸重复，但仍具有功能活性的转录本。 Reduced transcript levels via alternative splicing and / or post-transcriptional processing may produce excessive amplification lack or unstable (iii) nucleotide repeat, but still functionally active transcripts. 另外或可选择地，通过结合于mRNA的靶序列后启动或激活降解机制mRNA的稳定性会减少。 Additionally or alternatively, activation or degradation of the mRNA start mechanism will reduce the stability of the target sequence by binding to mRNA. 通过改变的RNA加工和/或剪接和/或RNA稳定性减少异常转录本可以预防异常的、重复扩增转录本在细胞中的积累和/或翻译。 Reducing the aberrant transcript by RNA processing and / or splicing and / or altered RNA stability could prevent abnormal repeated amplification transcript accumulation and / or translation in a cell. 不希望被理论限制，本发明的方法也考虑提供针对具有扩增重复的受累的转录本的特异性，因为针对扩增重复杂交的动力学是更有利的。  Without wishing to be bound by theory, the present invention also contemplate a method for providing the affected transcript with the amplified repeat specifically, because the kinetics of hybridization amplification is repeated for more advantageous. 重复特异性互补的核酸寡核苷酸分子与RNA或DNA分子中互补延伸杂交的可能性随着重复延伸的大小增加而增加。 The possibility of repeating the specific complementary nucleic acid oligonucleotide molecule and complementary to an RNA or DNA molecule increases with the size of the hybridizing extending extending repetition increases. RNA分子并且特别是包含互补序列的RNA分子通常内部配对，形成包含开环和封闭发夹状部分的二级结构。 RNA molecules and in particular RNA molecules typically inside comprising complementary sequences pair to form a secondary structure comprising open and closed hairpin parts. 只有所述开环部分对于互补核酸相对容易接近。 Only the open loop portion is relatively accessible for complementary nucleic acids. 与疾病无关的野生型转录本的短重复延伸经常只有5至约20-40重复并且由于其二级结构相对难以与互补核酸进行碱基配对。 Unrelated to disease wildtype transcript short repeated often extends only 5 to about 20-40 repeats and due to its secondary structure is relatively difficult to perform base pairing with a complementary nucleic acid. 相反，扩增的重复和与疾病相关的等位基因的重复单元通常至少是两倍扩增的但经常更多，3、5、10倍、高达100或对于某些不稳定重复病症甚至高于1000倍扩增。 In contrast, the repeat and disease associated allele amplification repeating units is typically at least twice, but more often it is amplified, 3,5,10-fold, up to 100 or even higher than some unstable repeat disorders 1000-fold amplification. 相对于野生型等位基因，这种扩增增加了重复部分是，至少临时是，处于开环结构的可能性并且因此而更易接近以与互补核酸分子进行碱基配对。 Relative to the wild-type allele, this amplification increases the overlapping portion is at least temporarily, the possibility is open loop structure and thereby more accessible to base-pair with a complementary nucleic acid molecule. 所以尽管事实是寡核苷酸与野生型和重复扩增的转录本中都存在的重复序列互补并且理论上与两种转录本都杂交，但本发明教导了与重复域互补的寡核苷酸优选与疾病相关的或导致疾病的转录本杂交并且相对不影响正常转录本的功能。 So despite the fact that repeat sequence of the oligonucleotide and the wild-type repeat expanded transcripts are complementary to and theoretically present in both transcripts were present hybridize with the teachings of the present invention is an oligonucleotide complementary to repeat domain preferably associated with the disease or cause disease transcript hybridization and relatively not affect the normal function of this transcript. 不管异常转录本降解的机制，这种选择性对于治疗重复不稳定性相关疾病是有益的。 Whether abnormal transcript degradation mechanism, for the treatment of such a selective repeat instability associated disease is beneficial. 另外，至少2倍扩增但经常更多，3、5、10倍、高达100或甚至高于1000倍扩增允许结合更多寡核苷酸，这可以对减少突变转录本的机制有额外的效果。 Further, at least 2-fold amplification, but more often, 3,5,10-fold, up to 100 or even higher than 1000 fold expansion allows more binding oligonucleotides, which can have an additional mechanism to reduce the mutated transcript effect. 在本文语境中，本文设计的寡核苷酸能够在患者的细胞中、在患者的组织中和/或在患者中减少“包含重复的基因转录”和/或“治疗任何不稳定顺式元件DNA重复相关的遗传病症”。 In the context of this document, the designed oligonucleotide is capable of, and / or reduce the "duplicate gene transcription" and / or "treatment of unstable cis-element in any patient in the tissue of the patient in the patient's cells DNA repeat associated genetic disorders. " 它优选意味着其减少包含延伸或不稳定数目重复的重复的疾病相关的或导致疾病的或突变的转录本在所述患者的细胞中、在所述患者的组织中和/或在所述中可检测数目。 It preferably comprises means which reduce or extend the number of unstable repeat disease associated repeated transcription or cause disease or mutated cells present in the patient, the tissue of the patient and / or in the medium The number can be detected. 可选择的或与前一句组合的，所述寡核苷酸可以减少所述突变转录本的翻译。 Alternatively or in combination with the previous one, the oligonucleotide can reduce translation of the mutated transcript. 因此本发明提供了不稳定顺势元件DNA重复相关的遗传病症的治疗方法，通过提供只与重复序列互补和/或可以杂交的核酸分子。  Thus, the present invention provides a method for treating DNA repeat instability homeopathic element associated genetic disorders, by providing only complementary to a repeat sequence and / or nucleic acid molecules can hybridize. 因此本方法优先靶向扩增重复转录本并且相对不影响正常的、野生型等位基因的转录本。 Thus, the present method preferentially targets amplified repeat transcripts and relatively affect the normal, wild-type allele transcript. 这是有利地，因为正常的等位基因可以因此提供基因的正常功能，取决于具有不稳定DNA重复的特定基因，这至少是理想的，并且可能在许多情况下对于待治疗细胞和/或个体是必需的。 This is advantageous since the normal allele can thus provide normal function of the gene, depending on the particular gene with unstable DNA repeats, which is at least desirable and cells may be treated and / or to the individual in many cases is compulsory. 因此在本发明语境中，本文设计的寡核苷酸可被用于治疗任何“顺势元件重复不稳定性相关的遗传病症”。 Therefore, in the context of the present invention, an oligonucleotide designed herein can be used to treat any "element repeat instability homeopathic associated genetic disorders." 所述病症优选任何疾病，其中指定基因的等位基因包含重复序列即所谓的不稳定重复序列，因为出现于所述重复序列中重复的数目会随着所述疾病发展而增加或扩增。 The disorder is preferably any of the diseases, wherein the allele comprises a gene designated a so-called repeat sequence instability of repetitive sequences, repeated sequences as the number of repetition in the occurrence of the disease will increase with the development or amplification. 所述重复数目的增加或扩增发生在一个指定个体和/或指定个体的连续世代（后代）中。 The increased number of repeats or amplification occurs in a given individual and / or a given individual consecutive generations (generations) in. 6病：亨廷顿病、霍河综合征（Haw River syndrome)、肯尼迪氏病/脊髓延髓性肌萎缩、脊髓小脑共济失调或有聚丙氨酸（GCG)重复的疾病例如：婴儿痉挛症、颅骨锁骨发育异常(cleidocranial dysplasia)、睑裂狭小/上睑下垂/倒转型内眦赘皮综合征、手脚生殖器症(hand-foot-genital syndrome)、并指(趾)多指(趾)畸形（synpolydactyly)、眼咽型肌营养不良、前脑无裂畸形。 6 disease: Huntington's disease, Huo River syndrome (Haw River syndrome), Kennedy's disease / spinal bulbar muscular atrophy, spinocerebellar ataxia or polyalanine (GCG) is repeated diseases such as: infantile spasms, skull collarbone dysplasia (cleidocranial dysplasia), blepharophimosis / ptosis / fall transition epicanthus syndrome, hand and foot genital syndrome (hand-foot-genital syndrome), and (toe) multi-finger (toe) malformations (synpolydactyly) , ocular pharyngeal muscular dystrophy, holoprosencephaly before. 如发明所述在基因非编码区有重复的待治疗的疾病包括三核苷酸重复病症（主要为CTG和/或CAG和/或CCTG重复）：强直性肌营养不良1型、强直性肌营养不良2型、弗里德赖希氏共济失调（主要为GAA)、脊髓小脑共济失调、自闭症。 The invention has the repeating disease to be treated include trinucleotide repeat disorders (mostly CTG repeats and / or CAG and / or CCTG) non-coding region of a gene: myotonic dystrophy type 1, myotonic muscular dystrophy bad type 2, Friedreich's ataxia (mainly GAA), spinocerebellar ataxia, autism. 而且本发明的方法可用于易脆位点相关的重复病症包括多种脆性X综合征、雅各布森综合征和其他不稳定重复元件病症例如癫痫性肌阵挛、面肩胛臂营养不良和糖尿病2型的某些形式。 Further methods of the invention may be used for fragile site associated repeat disorder comprising various fragile X syndrome, Jacobsen syndrome and other unstable repetitive element disorders such as myoclonus epilepsy, facioscapulohumeral dystrophy and diabetes some forms of type 2. 本发明的另一个优点是重复区域特异的寡核苷酸可被直接给药至细胞并且不依赖基于载体的递送系统。  Another advantage of the present invention is that the oligonucleotides specific for the repeat region may be administered directly to a cell and does not rely on vector-based delivery systems. 在现有技术中描述的技术，例如那些上文提到的用于治疗DMl的和从细胞中去除DMPK转录本的技术，需要使用基于载体的递送系统以给予细胞足够水平的寡核苷酸。 Techniques described in the prior art, such as those described and removal of DMPK transcripts from cells, techniques for the treatment of DMl mentioned above, it requires the use of vector based delivery systems to impart sufficient levels of oligonucleotides cells. 然而，由于目前对治疗用重组DNA载体的严格的安全规范、用于广泛临床应用的充足重组载体的生产和应用后对扩大的（或非特异的）应答有限的控制和逆转，治疗用途的质粒或病毒载体的使用还较不理想。 However, since the current treatment with a recombinant DNA vector stringent safety regulations, for the production and application of sufficient recombinant vectors for broad clinical application of expanded (or nonspecific) response limited control and reverse, therapeutic uses of the plasmid the use of viral vectors or also less than ideal. 尽管如此，将来的优化在这些领域是可能的，且质粒的病毒递送可以产生有利的长期持久的效应。 Nevertheless, the future of optimization in these areas is possible, and viral delivery of plasmids may have a favorable long-lasting effect. 本发明人惊人地发现了包含次黄嘌呤核苷和/或尿嘧啶和/或含有能形成摆动碱基对的碱基的核苷的寡核苷酸，所述寡核苷酸包含与扩增重复转录本的重复序列互补的序列或由其组成，由于它们用于杂交的分子靶标的扩增，所述寡核苷酸相对于对转录本中独特的序列特异的寡核苷酸，具有对其靶标显著增加的亲和性和/或亲和力。 The present inventors have surprisingly found that oligonucleotide comprising an inosine and / or uracile and / or a nucleotide containing a wobble base capable of forming a base pair oligonucleotide, said oligonucleotide comprising amplification repeat sequence complementary to the transcript sequences or consist of, as their molecular targets for hybridization amplification, the oligonucleotide with respect to the unique sequence-specific oligonucleotide transcript, having which significantly increased target affinity and / or avidity. 由于这种对重复扩增靶标转录本的高亲和性和亲和力，较低量的所述寡核苷酸足够产生足够的抑制和/或通过RNA酶H降解、RNA干扰降解或改变的转录后加工（包含但不仅限于剪接或外显子遗漏）活性减少重复扩增的等位基因。 Because of this repeat amplification of target transcripts of high affinity and affinity, the lower the amount of oligonucleotide sufficient to produce sufficient inhibition of transcription and / or RNA by RNase H degradation, RNA interference degradation or altered post processing (including but not limited to splicing or exon skipping) activities reduce duplication alleles amplified. 包含次黄嘌呤核苷和/或尿嘧啶和/或含有能形成摆动碱基对的碱基的核苷的寡核苷酸，所述寡核苷酸只与重复序列配对，可以通过合成产生并且当使用直接递送寡核苷酸至细胞和/或组织的普通应用技术直接递送至细胞时足够有效。 Contains inosine and / or uracile and / or containing a base able to form a wobble base pair nucleotide of an oligonucleotide, the oligonucleotide pair repeat sequence only, may be produced synthetically and when the direct delivery of oligonucleotides to cells and / or tissues of ordinary skill application directly delivered to cells sufficiently effective. 当需要时，重组载体递送系统可以通过使用本发明的方法和寡核苷酸规避。 When desired, the recombinant vector delivery system may be circumvented by using the method of the present invention and oligonucleotides. 如下文所解释的，包含次黄嘌呤核苷和/或尿嘧啶和/或含有能形成摆动碱基对的碱基的核苷的寡核苷酸的用途十分有吸引力。 As explained below, the oligonucleotide comprising an inosine and / or uracile and / or use of oligonucleotides containing nucleotide able to form a wobble base pair is very attractive. 例如，次黄嘌呤核苷是已知的修饰的碱基，可以与三种碱基配对：尿嘧啶、腺嘌呤和胞嘧啶。 For example, inosine modified bases are known, can be paired with three kinds of bases: uracil, adenine and cytosine. 次黄嘌呤核苷是通过将次黄嘌呤以β_Ν9-糖苷键连接到核糖环（也称为呋喃核糖）上形成的核苷。 Inosine to hypoxanthine are β_Ν9- by glycosidic linkages to the ribose ring (also referred ribofuranosyl) formed on the nucleoside. 次黄嘌呤核苷通常存在于tRNA中并且对于在摆动碱基对中遗传密码的正确翻译是必需的。 Inosine is typically present in the tRNA and for proper translation of the genetic code in a wobble base is required. 摆动碱基对是RNA 二级结构中基本的GU和IU/IA/IC对。 Wobble base pair in an RNA secondary structure and basic GU IU / IA / IC pair. 其热力学稳定性与沃森-克里克配对相当。 The thermodynamic stability and Watson - Crick pairing considerably. 摆动碱基对对于遗传密码的正确翻译是重要的。 Wobble base pair genetic code for the correct translation is important. 遗传密码通过在反密码子第一个碱基使用修饰的碱基对弥补了氨基酸（20)和三重密码子（64)的数量差异。 Genetic code by the first base of the anticodon modified base used to make up the difference in the number of amino acids (20) and a triplet codon (64). 相似地，当设计用于聚合酶链式反应的引物时，次黄嘌呤核苷是有用的，在于它会无差别地与腺嘌呤、 胸腺嘧啶、胞嘧啶配对。 Similarly, when designing primers for polymerase chain reaction, inosine is useful in that it indiscriminately with adenine, thymine, cytosine. 这允许人们设计跨越单个核苷酸多态性的引物，而不需要担心所述多态性会干扰引物的退火效率。 This allows one to design across a single nucleotide polymorphism primer, without worrying about the polymorphism interfere with primer annealing efficiency. 本发明中，出现在本文定义的寡核苷酸中的次黄嘌呤核苷和/或尿嘧啶和/或含有能形成摆动碱基对的碱基的核苷优选出现在所述寡核苷酸与本文定义的重复序列互补的部分。 In the present invention, appear in the oligonucleotide defined herein inosine and / or uracile and / or containing a base able to form a wobble base pair is preferably present in the nucleoside oligonucleotide repeat sequences are complementary to a portion as defined herein. 然而，次黄嘌呤核苷和/或尿嘧啶和/或含有能形成摆动碱基对的碱基的核苷也可以出现在所述寡核苷酸不与重复序列互补的部分，例如在如本文随后鉴定的靶向配体中。 However, inosine and / or uracil, and / or capable of forming nucleobase containing a wobble base pair may also be present in a portion not complementary to the repeat sequence of the oligonucleotide, as described in e.g. then the targeting ligand identified. 在本发明中，mRNA中（三）核苷酸重复扩增的表达可以导致多种依赖于三核苷酸重复序列和相关基因的疾病。  In the present invention, mRNA expression (iii) nucleotide repeat expansion can lead to various diseases dependent on the trinucleotide repeats and genes. 例如，DMl是由DMPK转录本的外显子15中（CUG)n重复引起的，而HD是由亨廷顿转录本的外显子1中（CAG)n重复引起的。 For example, by DM1 DMPK transcript exon 15 (CUG) n repeat caused by the HD Huntington transcript exon 1 (CAG) n repeat caused. 特异靶向这些扩增重复需要两种寡核苷酸，然而，使用包含次黄嘌呤核苷的寡核苷酸可以导致设计同时针对两种转录本激活的一种寡核苷酸，即包含（CIG)n、（IGC)n或（GCI)n或由其组成，优选核苷酸总长为9-50，更优选为12-40，最优选为15-30个。 These need to specifically target amplification repeated two oligonucleotides, however, inosine containing oligonucleotide can be designed to result in transcripts for both simultaneously activated one oligonucleotide that comprises ( CIG) n, (IGC) n or (GCI) n or consist of, the total length is preferably 9-50 nucleotides, more preferably 12-40, most preferably 15-30. 在整个申请的语境中，本领域技术人员会理解η 是优选为1、2、3、4、5、6、7、8、9、10、11、12、13、14、15、16、17、18、19、20 或更多的整数。 In the context of the entire application, the skilled artisan will appreciate that η is preferably 1,2,3,4,5,6,7,8,9,10,11,12,13,14,15,16, 17,18,19,20 or more integer. 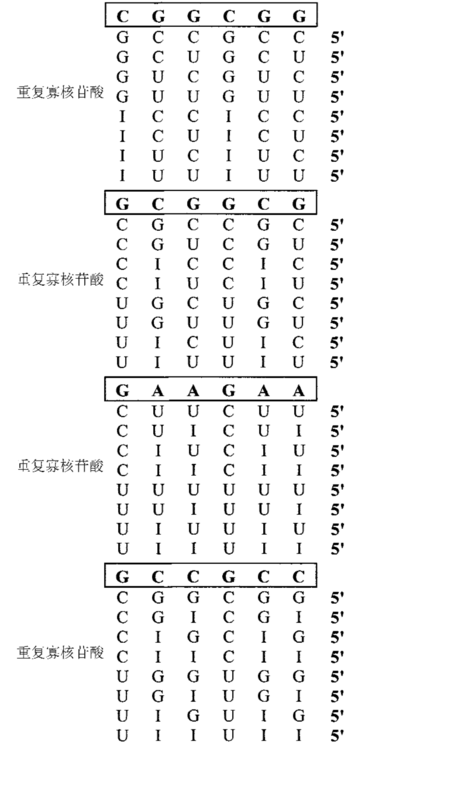 然而， 所述寡核苷酸的长度本身并非是3的倍数。 However, the length of the oligonucleotide itself is not a multiple of 3. 在实施方案中，本发明的寡核苷酸有3的倍数的长度。 In embodiments, oligonucleotides of the invention have a length of a multiple of three. 因此，使用次黄嘌呤核苷和/或尿嘧啶和/或含有能形成摆动碱基对的碱基的核苷可以减少必须设计或开发的可能用于针对数种疾病的药物的核酸分子的数量。 Thus, inosine and / or uracile and / or containing a base able to form a wobble base pair nucleotide can reduce the number of nucleic acid molecules for several diseases of the medicament must be possible for the design or development . 表2举例说明如何设计针对每种已知重复的包含次黄嘌呤核苷和/或尿嘧啶的寡核苷酸。 Table 2 illustrates how to repeat every known design comprises inosine and / or an oligonucleotide for uracil. 在第一方面，本发明公开和教导了优选包含次黄嘌呤核苷和/或尿嘧啶和/或含有能形成摆动碱基对的碱基的核苷的寡核苷酸用于制备诊断、治疗或预防人类与顺式元件重复不稳定性相关的遗传病症的药物的用途，所述寡核苷酸优选为RNA酶H基本上非依赖的，以及所述寡核苷酸包含只与人类基因转录本的重复序列互补的序列或由其组成。  In a first aspect, the present invention discloses and teaches preferably comprising an inosine and / or uracile and / or a nucleotide containing a base able to form a wobble base pair oligonucleotide for the preparation of diagnosis, treatment or prevention of a human cis-element repeat instability associated genetic medicament disorder, the oligonucleotide preferably is substantially non-dependent RNA RNase H, and the oligonucleotide includes only repeat transcript sequence complementary to the human gene or consist. 因此本发明提供了与顺势元件重复不稳定相关的遗传病症的治疗方法。 Thus, the present invention provides methods of treatment with homeopathic element repeat instability associated genetic disorders. 在第二方面，本发明还涉及优选包含次黄嘌呤核苷和/或尿嘧啶和/或含有能形成摆动碱基对的碱基的核苷的寡核苷酸，所述寡核苷酸优选为RNA酶H基本上非依赖的并且所述寡核苷酸优选用于本发明的第一方面和/或应用于本发明的方法中以预防重复扩增的转录本在细胞中积累和/或翻译。  In a second aspect, the present invention also relates preferably comprising an inosine and / or uracile and / or a nucleotide containing a base able to form a wobble base pair oligonucleotide, the oligonucleotide nucleotide RNA enzyme is preferably H substantially independent and said oligonucleotide is preferably used in the first aspect and / or methods of the present invention is applied to the present invention to prevent the accumulation of repeat expanded transcripts in cells and / or translation. 优选包含次黄嘌呤核苷和/或尿嘧啶和/或含有能形成摆动碱基对的碱基的核苷的寡核苷酸优选是RNA酶H基本上非依赖的并且可以包含只与如下文定义的重复序列互补的序列。  preferably comprising an inosine and / or uracile and / or a nucleotide containing oligonucleotides capable of forming a wobble base pair RNA bases are preferably substantially non-RNase H-dependent and may include only repetitive sequence as defined below and a sequence complementary. 这意味着所述寡核苷酸还可以包含不与待治疗细胞中存在的序列互补的额外部分。 This means that said oligonucleotide may not also comprise additional portions complementary to the sequence present in the cell to be treated. 例如所述额外部分可以是克隆过程中加入的，和/或是如本文随后定义的靶向部分。 For example, the additional moiety may be added during the cloning and / or subsequent targeting moiety as defined herein. 在可选择的实施方案中，这可以意味着所述寡核苷酸还可以包含与待治疗细胞中存在的序列互补的额外部分。  In alternative embodiments, it may mean that the oligonucleotide may further comprise additional portions complementary to the sequence present in the cell to be treated. 例如这一额外部分可以是侧翼连接于重复区域的序列。 This additional part may for example be the sequence repeats flanking region. 或者， 这一额外部分可以例如是不直接侧翼连接于重复区域的序列。 Or, this additional part may for example be not directly repeating flanking region sequence. 或者，这一额外部分可以例如是不直接侧翼连接于重复区域并且包含功能基序（例如，但不仅限于，ESE)的序列。 Or, this additional part may for example be not directly repeating flanking region sequences and comprising a functional group (e.g., but not limited to, ESE) sequence. 或者，例如这一额外部分可以是不直接侧翼连接于重复区域但由于二级或三级结构而接近。 Or, this additional part may for example be not directly repeating flanking region but the secondary or tertiary structure similar. 优选地，所述重复序列是本发明的寡核苷酸全长的至少50 %，更优选至少60 %，甚至更优选至少70 %，甚至更优选至少80 %，甚至更优选至少90 %或更多。 Preferably, the repeat sequence is at least 50% of the entire length of the oligonucleotides of the present invention, more preferably at least 60%, even more preferably at least 70%, even more preferably at least 80%, even more preferably at least 90%, or more many. 在最优选实施方案中，本发明的寡核苷酸由只与下文定义的重复序列互补的序列组成。 In a most preferred embodiment, the oligonucleotides of the present invention is defined by only the following repeat sequence complementary to the sequence. 例如，寡核苷酸可以包含只与下文定义的重复序列互补的序列和随后称为靶向配体的靶向部分。 For example, the oligonucleotide may comprise only the repeat sequence complementary to a sequence as defined below and subsequently referred to as the targeting portion of a targeting ligand. 重复或重复元件或重复序列或重复延伸在本文定义为至少3、4、5、10、100、1000 或更多连续重复的重复单元或重复核苷酸单元或包含在受试者包括人受试者的基因组中转录的基因序列中的三核苷酸重复单元、或可选地4、5或6核苷酸重复单元的重复核苷酸单元。  repeat or repetitive element or repetitive sequence or repetitive extension is defined herein as at least 3,4,5,10,100,1000 or more consecutive repeat unit or repeat nucleotide unit or repeat contained in a subject comprising repetitive nucleotide unit a gene sequence of the genomic human subject transcribed trinucleotide repeat unit, or alternatively 5 or 6 nucleotide repeat unit. 本发明的寡核苷酸优选含有或包含次黄嘌呤核苷和/或尿嘧啶和/或含有能形成摆动碱基对的碱基的核苷。  The oligonucleotides of the present invention preferably comprises or comprising an inosine and / or uracile and / or nucleosides containing a base able to form a wobble base pair. 更优选地，所述寡核苷酸包含次黄嘌呤核苷和/或尿嘧啶。 More preferably, the oligonucleotide comprising an inosine and / or uracil. 在本发明的语境中，含有（contain)优选意味着包含（comprise)。 In the context of the present invention, comprising (Contain) means preferably comprises (comprise). 包含次黄嘌呤核苷和/或尿嘧啶和/或含有能形成摆动碱基对的碱基的核苷的寡核苷酸可以定义为其中至少一个核苷被次黄嘌呤核苷和/或尿嘧啶和/或含有能形成摆动碱基对的碱基的核苷取代的寡核苷酸。 Contains inosine and / or uracile and / or a nucleotide containing a wobble base capable of forming a base pair may be defined as an oligonucleotide wherein at least one nucleoside is inosine and / or urine pyrimidine and / or nucleosides containing a base able to form a wobble base pair substitutions oligonucleotides. 本领域技术人员知道如何测试核苷是否含有能形成摆动碱基对的碱基。 The skilled person knows how to test whether it contains nucleoside base able to form a wobble base pair. 例如由于次黄嘌呤核苷可与尿嘧啶、腺嘌呤和/或胞嘧啶形成碱基对，这意味着至少一个可与尿嘧啶、腺嘌呤和/或胞嘧啶形成碱基对的核苷被次黄嘌呤核苷取代。 For example due to inosine can form a base pair with uracil, adenine and / or cytosine, which means may be formed with at least one of uracil, adenine and / or cytosine base of the nucleosides are views inosine substituted. 然而，为了维护特异性，包含次黄嘌呤核苷的寡核苷酸优选包含至少一个可与尿嘧啶或腺嘌呤或胞嘧啶形成碱基对的核苷取代。 However, in order to maintain specificity, inosine containing oligonucleotide preferably comprises at least one formed uracil or adenine or cytosine base pair substituted nucleosides. 更优选地，所有可与尿嘧啶或腺嘌呤或胞嘧啶形成碱基对的核苷都被次黄嘌呤核苷取代。 More preferably, all be formed with uracil or adenine or cytosine base of the nucleosides are substituted with inosine. 例如，与重复元件（CAG)n或（CUG)n互补的包含次黄嘌呤核苷的寡核苷酸会包含(CIG)n、或（IGC)n、或（GCI)n 或由其组成。 For example, a repetitive element (CAG) n or (CUG) n inosine comprising complementary oligonucleotide contains (CIG) n, or (IGC) n, or (GCI) n or consist. 表2 示出可与（CAG)n、(CUG)η, (CGG)η, (GCG) η、(GAA)η, (GCC)n或（CCUG)n互补的包含次黄嘌呤核苷和/或尿嘧啶的寡核苷酸的实例。 Table 2 shows with (CAG) n, (CUG) η, (CGG) η, (GCG) η, (GAA) η, (GCC) n, or (CCUG) n complementary oligonucleotide comprising an inosine and / examples of oligonucleotides, or uracil. 为了便利，在此表中η采用2。 For convenience, this Table 2 η employed. 本领域技术人员会理解对于本发明的寡核苷酸，如本文随后定义的，η优选为包含3-17的整数。 Those skilled in the art will appreciate that the present invention is for a nucleotide oligonucleotide, as later defined herein, preferably an integer of 3-17 [eta] it includes. 可以通过在指定重复序列（或基序）的任意位置开始或结束设计特异寡核苷酸，而没有一个或其他因而产生的序列更有效的的损害，这对于本领域技术人员也是显而易见的。 Damage can start or end at the specified design specific oligonucleotide repeats (or motifs) in an arbitrary position, but without one or other sequences thereby creating a more efficient, which the skilled person is readily apparent. 例如与重复元件（CAG)n或（CUG)n互补的包含次黄嘌呤核苷的寡核苷酸会包含（CIG)n、或（IGC)n、或（GCI)n或由其组成。 For example, a repetitive element (CAG) n or (CUG) n comprises an oligonucleotide complementary to contain inosine (CIG) n, or (IGC) n, or (GCI) n or consist. 本发明也包括由于如本文定义的寡核苷酸中至少一个核苷被次黄嘌呤核苷和/或尿嘧啶和/或含有能形成摆动碱基对的碱基的核苷取代，与重复元件诸如（CAG)n互补的寡核苷酸可以包含（CIG)n或由其组成。 The present invention also includes at least one nucleoside is substituted by inosine and / or uracile and / or nucleosides containing a base able to form a wobble base pair as defined herein due to the oligonucleotide, a repetitive element such as a (CAG) n may comprise a complementary oligonucleotide (CIG) n, or consist. 如上所提及的，所述互补的寡核苷酸也可以包含（IGC)n或（GCI)n或由其组成。 As mentioned above, a complementary oligonucleotide may contain (IGC) n or (GCI) n or consist. 如果以(CIG)n为例，以η为3为例，本发明包括基于诸如（CIG) 3的指定式的在所示位置包含1或2或3个次黄嘌呤核苷的任何可能的寡核苷酸：(CTG) (CIG) (CTG)、(CIG) (CTG) (CTG)、(CIG) (CTG)(CIG)、(CIG)(CIG) (CTG)、(CIG)(CIG) (CIG)。 If (CIG) n, for example, to as η 3, for example, based on the present invention includes any possible oligonucleotides such as (the CIG) specified formula comprise 1 or 2 or 3 inosine at the position shown in FIG. 3 nucleotide: (CTG) (CIG) (CTG), (CIG) (CTG) (CTG), (CIG) (CTG) (CIG), (CIG) (CIG) (CTG), (CIG) (CIG) (CIG). 包含次黄嘌呤核苷和/或尿嘧啶和/或含有能形成摆动碱基对的碱基的核苷的寡核苷酸，所述寡核苷酸优选是RNA酶H基本上非依赖的，可以是单链的或双链的。  oligonucleotide comprising an inosine and / or uracile and / or a nucleotide containing a base able to form a wobble base pair oligonucleotide, the oligonucleotide is an RNA enzyme is preferably substantially non-H dependent and may be single-stranded or double-stranded. 双链的意味着寡核苷酸是两条互补链形成的异质二聚体，例如在siRNA中。 It means double-stranded oligonucleotide is a heterodimer formed by two complementary strands, for example, in the siRNA. 在优选实施方案中，寡核苷酸是单链的。 In a preferred embodiment, the oligonucleotide is single-stranded. 本领域技术人员会理解尽管单链寡核苷酸可以形成内部双链结构。 Those skilled in the art will appreciate that although the internal structure of a double-stranded oligonucleotide may single-stranded form. 然而这种寡核苷酸在本发明语境中仍然被称为单链核苷酸。 However, this oligonucleotide in the context of the present invention is still referred to as single-stranded nucleotide. 单链寡核苷酸与双链siRNA寡核苷酸相比有数种优势：（i)其合成预期比两条互补siRNA链更为简单；（ii)有更宽的化学修饰可能性范围以优化更有效地摄入细胞、更好的（生理的）稳定性和减少可能的遗传不利效应；（iii) siRNA有更高的非特异作用（包括脱靶基因）和放大的药理学（例如，通过治疗方案或剂量对有效性和选择性的较小控制可能性）的可能性和（iv) siRNA较不可能在细胞核中起作用并且不能直接针对内含子。 Compared with a single-stranded oligonucleotide is double-stranded siRNA oligonucleotides are several advantages: (i) its synthesis is expected easier than two complementary siRNA strands; (ii) the possibility of a wider range of chemical modifications to optimize cells more effectively uptake, a better (physiological) stability and to decrease possible adverse effects of genetic; (iii) siRNA higher non-specific effect (including off-target gene) amplification and pharmacological (e.g., by treatment the possibility of the program or dose effectiveness and less possibility of selective control) and (iv) siRNA and not less likely for introns to function directly in the nucleus. 因此，在第一方面的优选实施方案中，本发明涉及优选包含次黄嘌呤核苷和/或尿嘧啶和/或含有能形成摆动碱基对的碱基的核苷的单链寡核苷酸用于制备用于诊断、治疗或预防人类与顺式元件重复不稳定性相关的遗传病症的药物的用途，所述寡核苷酸优选是RNA酶H基本上非依赖的，以及所述寡核苷酸包含只与人类基因转录本的重复序列互补的序列或由其组成。 Thus, in a preferred embodiment of the first aspect, the present invention relates preferably comprising an inosine and / or uracile and / or single-stranded oligonucleotide containing a base able to form a wobble base pair nucleotide nucleotide for the preparation for the diagnosis, treatment or prevention of a human cis-element repeat instability associated genetic medicament disorder, the RNA oligonucleotide is preferably substantially independent of RNase H, the oligonucleotide and It contains only nucleotide sequences complementary to repetitive sequences of human gene transcript or consist. 9至更优选12-30个，甚至更优选15-30个核苷酸以及最优选为与优选有三核苷酸重复单元或四核苷酸重复单元的重复延伸互补的12-25个核苷酸。 9 more preferably 12 to 30, and even more preferably 15-30 nucleotides and most preferably the trinucleotide repeat units preferably has a tetranucleotide repeat unit or repeat nucleotide extension complementary to 12-25 . 优选包含次黄嘌呤核苷和/或尿嘧啶和/或含有能形成摆动碱基对的碱基的核苷的寡核苷酸优选是RNA酶H基本上非依赖的，可以与转录本编码区域优选聚谷氨酰胺（CAG)或聚丙氨酸（GCG)编码域中的重复延伸互补和/或能够与之杂交。 Preferably comprising an inosine and / or uracil, and / or contain oligonucleotides capable of forming nucleobase wobble base pair is preferably RNAse H substantially independent RNA may be the coding region of the present transcription preferably extends polyglutamine repeats (CAG) or a polyalanine (GCG) coding domain complementary to and / or capable of hybridizing thereto. 所述寡核苷酸也可以与存在于前体RNA分子中的非编码区域例如5'或3'非翻译区域或内含子序列互补和/或能够与之杂交。 The oligonucleotide may also be present in the non-coding region of the precursor RNA molecule such as 5 'or 3' untranslated regions, or intronic sequences complementary to and / or capable of hybridizing thereto. 在优选实施方案中，优选包含次黄嘌呤核苷和/或尿嘧啶和/或含有能形成摆动碱基对的碱基的核苷、优选是RNA酶H基本上非依赖的并且用于本发明的方法的寡核苷酸包含与具有选自（CAG) n、（GCG) η、（CUG) η、（CGG) η、（GAA) η、（GCC) η 和（CCUG) η 的重复核苷酸单元作为重复核苷酸单元的重复元件互补的序列或由其组成。  In a preferred embodiment, preferably comprising an inosine and / or uracile and / or containing a base able to form a wobble base pair nucleotide, preferably RNAse H substantially independent RNA and with in the process of this invention comprises an oligonucleotide having a selected (CAG) n, (GCG) η, (CUG) η, (CGG) η, (GAA) η, (GCC) η and (CCUG) η of repetitive nucleotide unit a repetitive nucleotide unit a repetitive element sequence complementary or consist. 所述寡核苷酸可以是单或双链寡核苷酸。 The oligonucleotide may be single or double stranded oligonucleotide. 在优选实施方案中，所述寡核苷酸是双链的。 In a preferred embodiment, the oligonucleotide is double stranded. 因为寡核苷酸优选包含至少9 至约50个与重复元件互补的连续核苷酸，更优选包含至少9-50个与重复元件互补的连续核苷酸，这意味着η是包含3-17的整数，更优选为4-15，甚至更优选为4_14，甚至更优选为4-13，甚至更优选为4-10，甚至更优选为5-10和最优选为4-8或4_9。 Because the oligonucleotide preferably comprises at least about 9 to 50 with consecutive nucleotides complementary to a repetitive element, more preferably with at least 9-50 contiguous nucleotides complementary to a repetitive element, which means comprising 3-17 η integer, more preferably 4-15, even more preferably 4_14, even more preferably 4-13, even more preferably 4-10, even more preferably 5-10 and most preferably 4-8 or 4_9. 优选包含次黄嘌呤核苷和/或尿嘧啶和/或含有能形成摆动碱基对的碱基的核苷和优选为RNA酶H基本上非依赖的以及包含与转录本中聚谷氨酰胺（CAG)n域互补的序列或由其组成的寡核苷酸的用途，特别用于诊断、治疗和/或预防由于HD、HDL2/JPH3、SBMA/ AR、SCAl/ATXU SCA2/ATX2、SCA3/ATX3、SCA6/CACNAIA、SCA7、SCA17、AR 或DRPLA 人基因重复扩增引起的人类病症亨廷顿病、几种形式的脊髓小脑共济失调或霍河综合征、X连锁的脊髓和延髓性肌萎缩和/或齿状核红核苍白球萎缩症。  preferably comprising an inosine and / or uracile and / or containing a base able to form a wobble base pair RNA nucleosides and preferably RNAse H substantially independent and comprising a transcript polyglutamic n domain sequence complementary amide (CAG) or by use of the oligonucleotide composition, in particular for diagnosing, treating and / or preventing HD, HDL2 / JPH3, SBMA / AR, SCAl / ATXU SCA2 / ATX2, SCA3 / ATX3, SCA6 / CACNAIA, SCA7, SCA17, AR DRPLA human gene duplication or amplification of human disease caused by Huntington's disease, several forms of spinocerebellar ataxia or Huo River syndrome, X-linked spinal and bulbar muscular atrophy and / or dentate pallidoluysian atrophy. 这类寡核苷酸，优选包含次黄嘌呤核苷的这类寡核苷酸优选包含（CIG)n、或（IGC)n、或（GCI)n或由其组成。 Such an oligonucleotide, preferably comprising such an oligonucleotide preferably comprising an inosine (CIG) n, or (IGC) n, or (GCI) n or consist. 对于其他优选可能性见表2。 Other preferred possibilities for Table 2. 优选包含次黄嘌呤核苷和/或尿嘧啶和/或含有能形成摆动碱基对的碱基的核苷、优选为RNA酶H基本上非依赖的以及包含与转录本中聚丙氨酸（GCG)n域互补的序列或由其组成的寡核苷酸的用途，特别用于诊断、治疗和/或预防由于ARX、CBFA1、F0XL2、 HOXAl3, H0XD13、0PDM1PABP2、TCFBRl或ZIC2人基因重复扩增引起的人类病症：婴儿痉挛症、颅骨锁骨发育不良、睑裂狭小、手脚生殖器症、并指（趾）多指（趾）畸形、眼咽型肌营养不良和/或前脑无裂畸形。  preferably comprising an inosine and / or uracile and / or RNA RNase H substantially independent and comprising polypropylene transcript capable of forming nucleobase containing ammonia wobble base pair, preferably with acid (GCG) n sequence complementary to a region or by use of the oligonucleotide composition, in particular for diagnosing, treating and / or preventing ARX, CBFA1, F0XL2, HOXAl3, H0XD13,0PDM1PABP2, TCFBRl human gene duplication or ZIC2 amplified due to human disorders: infantile spasms, cranial clavicle dysplasia, blepharophimosis, hands and feet, genital disease, and (toe) multi-finger (toe) malformations, ocular pharyngeal muscular dystrophy and / or holoprosencephaly ago . 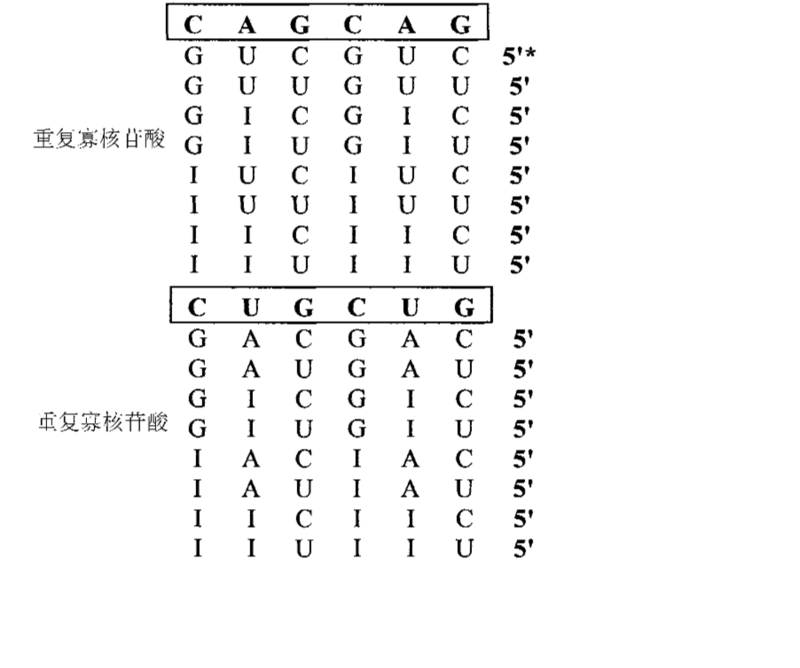 对于优选的寡核苷酸见表2。 For preferred oligonucleotides are shown in Table 2. 优选包含次黄嘌呤核苷和/或尿嘧啶和/或含有能形成摆动碱基对的碱基的核苷、优选为RNA酶H基本上非依赖的以及包含与转录本中（CUG)n重复互补的序列或由其组成的寡核苷酸的用途，特别用于诊断、治疗和/或预防分别由于DM1/DMPK、SCA8或JPH3基因重复扩增引起的人类遗传病症强直性肌营养不良1型、脊髓小脑共济失调8和/或类亨廷顿病2。  preferably comprising an inosine and / or uracil, and / or capable of forming nucleobase containing a wobble base pair, preferably RNA RNase H substantially independent and comprising a transcript (CUG ) n repeat sequence complementary oligonucleotide or by use of a composition, in particular for the diagnosis, treatment and / or prevention of the human genetic disorder myotonic muscular dystrophy are due DM1 / DMPK, SCA8 or amplification due to gene duplication JPH3 adverse type 1, spinocerebellar ataxia 8 and / or Huntington's disease type 2. 优选地，这些基因来自人的来源。 Preferably, these genes are from human sources. 这类寡核苷酸，优选这类含有次黄嘌呤核苷的寡核苷酸优选包含（CIG)n、或（IGC)n、或（GCI)n或由其组成。 Such an oligonucleotide, preferably such an oligonucleotide preferably comprising an inosine (CIG) n, or (IGC) n, or (GCI) n or consist. 对于其他优选的寡核苷酸， 见表2。 For other preferred oligonucleotides, see Table 2. 优选包含次黄嘌呤核苷和/或尿嘧啶和/或含有能形成摆动碱基对的碱基的核苷、优选为RNA酶H基本上非依赖的以及包含与转录本中（CCUG)n重复互补的序列或由其组成的寡核苷酸的用途，特别用于诊断、治疗和/或预防由于DM2/ZNF9基因重复扩增引起的人类遗传病症强直性肌营养不良2型。  preferably comprising an inosine and / or uracil, and / or capable of forming nucleobase containing a wobble base pair, preferably RNA RNase H substantially independent and comprising a transcript (CCUG ) n repeat sequence complementary oligonucleotide or by use of a composition, in particular for the diagnosis, treatment and / or prevention of the human genetic disorder myotonic since the DM2 / ZNF9 gene amplification induced malnutrition was repeated 2. 对于优选的寡核苷酸，见表2。 For preferred oligonucleotides, see Table 2. 优选包含次黄嘌呤核苷和/或尿嘧啶和/或含有能形成摆动碱基对的碱基的核苷、优选为RNA酶H基本上非依赖的以及包含与转录本中（CGG)n重复互补的序列或由其组成的寡核苷酸的用途，特别用于诊断、治疗和/或预防由于FRAXA/FMR1、FRAXE/FMR2和FRAXF/FAM11A基因重复扩增引起的人类脆性X综合征。  preferably comprising an inosine and / or uracil, and / or capable of forming nucleobase containing a wobble base pair, preferably RNA RNase H substantially independent and comprising a transcript (CGG ) n repeat sequence complementary oligonucleotide or by use of a composition, in particular for the diagnosis, treatment and / or prevention because FRAXA / FMR1, FRAXE / FMR2 and FRAXF / FAM11A genes of human fragile X repeat expansion induced synthesis sign. 对于优选的寡核苷酸，见表2。 For preferred oligonucleotides, see Table 2. 优选包含次黄嘌呤核苷和/或尿嘧啶和/或含有能形成摆动碱基对的碱基的核苷、优选为RNA酶H基本上非依赖的以及包含与转录本中（CCG)n重复互补的序列或由其组成的寡核苷酸的用途，特别用于诊断、治疗和/或预防由于FRA11B/CBL2基因重复扩增引起的人类遗传病症雅各布森综合征。  preferably comprising an inosine and / or uracil, and / or capable of forming nucleobase containing a wobble base pair, preferably RNA RNase H substantially independent and comprising a transcript (CCG ) n repeat sequence complementary oligonucleotide or by use of a composition, in particular for the diagnosis, treatment and / or prevention of the human genetic disorder due FRA11B / CBL2 gene Jacobsen syndrome, caused by repeat expansion. 对于优选的寡核苷酸，见表2。 For preferred oligonucleotides, see Table 2. 优选包含次黄嘌呤核苷和/或尿嘧啶和/或含有能形成摆动碱基对的碱基的核苷、优选为RNA酶H基本上非依赖的以及包含与转录本中（GAA)n重复互补的序列或由其组成的寡核苷酸的用途，特别用于诊断、治疗和/或预防人类遗传病症弗里德赖希氏共济失调。  preferably comprising an inosine and / or uracil, and / or capable of forming nucleobase containing a wobble base pair, preferably RNA RNase H substantially independent and comprising a transcript (GAA ) n repeat sequence complementary oligonucleotide or by use of a composition, in particular for the diagnosis, treatment and / or prevention of Friedreich's ataxia human genetic disorders. 对于优选的寡核苷酸，见表2。 For preferred oligonucleotides, see Table 2. 优选包含次黄嘌呤核苷和/或尿嘧啶和/或含有能形成摆动碱基对的碱基的核苷、优选为RNA酶H基本上非依赖的以及包含与内含子中（ATTCT)n重复互补的序列或由其组成的寡核苷酸的用途，特别用于诊断、治疗和/或预防人类遗传病症脊髓小脑共济失调10型（SCAlO)。  preferably comprising an inosine and / or uracile and / or introns and contained comprising nucleobases capable of forming a wobble base pair, preferably a substantially non-RNA-dependent RNase H ( ATTCT) n repeat sequence complementary oligonucleotide or by use of a composition, in particular for the diagnosis, treatment and / or prevention of the human genetic disorder spinocerebellar ataxia type 10 (SCAlO). 对于优选的寡核苷酸，见表2。 For preferred oligonucleotides, see Table 2. 所述重复互补的寡核苷酸或用于本发明方法中的寡核苷酸可以包含以下或由以下组成：RNA、DNA、锁核酸（LNA)、肽核酸（PNA)、吗啡啉磷酰二胺（morpholino phosphorodiamidates) (PMO)、乙烯桥核酸（ENA)或其包含天然存在的DNA和RNA核苷酸以及合成的、修饰的核苷酸组合物的混合物或杂交物。  The repeating oligonucleotide or a complementary oligonucleotide method of the present invention may comprise or consist of the following: RNA, DNA, locked nucleic acid (LNA), peptide nucleic acid (PNA), morpholino phosphorodiamidate (morpholino phosphorodiamidates) (PMO), ethylene bridged nucleic acid (ENA) thereof comprising naturally occurring nucleotides as well as DNA and RNA synthesis, or a hybrid mixture of modified nucleotide compositions. 本领域技术人员也会认识到，任何人类核苷酸碱基，并且任何其他天然或合成的核苷酸碱基或其衍生物都可以被使用，例如： 2_胺基嘌呤、胸腺嘧啶代替尿嘧啶、5-甲基胞嘧啶、5-甲基次黄嘌呤核苷、5-甲基鸟嘌呤核苷、二胺基腺嘌呤。 Those skilled in the art will recognize, any human nucleotide bases, and any other natural or synthetic nucleotide bases, or derivatives thereof can be used, for example: amine 2_ purine, thymine instead of urinary pyrimidine, 5-methylcytosine, 5-methyl-inosine, 5-methyl guanosine, adenine diamino. 本领域技术人员也会认识到有许多寡核苷酸的合成衍生物。 Those skilled in the art will recognize that there are many synthetic derivatives of oligonucleotides. 因此“寡核苷酸”包括，但不限于磷酸二酯、磷酸三酯、硫代磷酸酯、二硫代磷酸酯、二胺基硫代磷酸酯和H-磷酸酯衍生物。 Thus "oligonucleotide" include, but are not limited to phosphodiester, phosphotriester, phosphorothioate, phosphorodithioate, phosphorothioates and H- diamine phosphate derivatives. 它还包括天然存在的和合成的寡核苷酸衍生物。 It also includes naturally occurring and synthetic oligonucleotide derivatives. 在这类寡核苷酸中，磷酸二酯主链化学还可以被其他修饰取代，例如硫代磷酸酯或甲基磷酸酯。  In such oligonucleotides, the phosphodiester backbone chemistry may further be substituted with other modifications, such as phosphorothioates or methylphosphonates. 已存在其他的寡核苷酸修饰，新的寡核苷酸修饰也可能被开发和用于实践。 Already there are other oligonucleotide modifications, new oligonucleotide modifications may also be developed and used in practice. 然而，所有这些寡核苷酸具有寡聚体的特征，能够序列特异结合于RNA。 However, all of these oligonucleotides having the features oligomers, capable of sequence-specific binding to RNA. 因此，在优选实施方案中，寡核苷酸包含以下或由以下组成：有或没有含有硫代磷酸酯的主链的RNA核苷酸、 2' 0-取代的RNA核苷酸、DNA核苷酸、锁核酸（LNA)核苷酸、肽核酸（PNA)核苷酸、吗啡啉磷酰二胺、乙烯桥核酸（ENA)核苷酸或其混合物。 Thus, in a preferred embodiment, the oligonucleotide comprises or consists of the following: with or without RNA nucleotides containing phosphorothioate backbones, 2 '0- substituted RNA polynucleotides, DNA nucleosides acid, locked nucleic acid (LNA) nucleotides, peptide nucleic acids (PNA) nucleotides, morpholino phosphorodiamidate, ethylene-bridged nucleic acid (ENA) nucleotides or mixtures thereof. 至少部分含有天然存在的DNA核苷酸的寡核苷酸用于在细胞中通过RNA酶H活性(EC. 3. 1. 26. 4)诱导DNA-RNA杂交分子降解。  at least in part naturally occurring DNA nucleotides comprising an oligonucleotide RNA by RNase H activity for inducing degradation of DNA-RNA hybrid molecule (EC. 3. 1. 26. 4) in a cell. 包含天然存在的RNA核糖核苷酸或类RNA合成的核糖核苷酸的寡核苷酸可以应用于本发明的方法中以形成双链RNA-RNA杂交物，其通过RNA干扰或沉默（RNAi/siRNA)途径作为酶依赖性反义起作用，包括通过正_反义链配对的靶RNA识别，随后通过RNA诱导的沉默复合体（RISC)降解靶RNA。  RNA ribonucleotides comprising naturally occurring or synthetic RNA-ribonucleotide oligonucleotides may be applied to the method of the present invention to form double stranded RNA-RNA hybrids, by RNA interference or silencing (RNAi / siRNA) pathways act as enzyme-dependent antisense, including target RNA recognition through n _ antisense strand pairing followed by target RNA degradation by the RNA-induced silencing complex (RISC). 11漏，通过结合于RNA转录本的靶序列以及阻碍例如翻译的过程或封闭剪接供体或剪接受体位点。 A drain 11, through a process of binding to a target sequence of RNA transcript and obstacles such as translation or blocking of splice donor or splice acceptor sites. 利用修饰的反义寡核苷酸改变剪接和外显子遗漏技术有很多文献记载，是本领域技术人员已知的，并且例如可以在US6, 210, 892、W09426887、W0041083446和W002124906中找到。 Using modified antisense oligonucleotides alter splicing and exon skipping techniques are well documented, known to the skilled person, and for example, 210, 892, W09426887, W0041083446 and W002124906 found in US6. 此外，空间位阻可以抑制蛋白质、核因子等的结合并且因此有助于在如DMl的疾病中减少核积聚或核糖核酸灶。 Moreover, steric hindrance may inhibit the binding of proteins, nuclear factors and the like and thus helps to reduce nuclear accumulation or RNA in tumor diseases, such as DMl. 本文定义的可以包含合成的或修饰的核苷酸、与（扩增）重复序列互补的寡核苷酸用于本发明的方法中，用于通过siRNA/RNA干扰或沉默途径减少或失活包含重复的转录本。  defined herein may comprise synthetic or modified nucleotides, and (amplified) repeat sequence complementary to an oligonucleotide used in the methods of the present invention, for reducing by siRNA / RNA interference or silencing pathway or inactivation duplicate transcripts. 用于本发明中方法的单或双链寡核苷酸可以包含以下或由以下组成：DNA核酸、 RNA核酸、2' -0取代的核糖核苷酸（优选2' -0-取代的RNA硫代磷酸酯核苷酸）包括烷基和甲氧基乙基取代（包括本文确定的2'-4'约束的变体）、肽核酸（PNA)、锁核酸（LNA)和吗啡啉（PMO)反义寡核苷酸和乙烯桥核苷酸（ENA)和其组合物，任选地RNA酶H依赖反义的嵌合体。  Single or double stranded oligonucleotides used in the method of the present invention may comprise or consist of: DNA nucleic acid, RNA nucleic acid, 2 '-0 substituted ribonucleotides (preferably 2' substituted -0- the RNA phosphorothioate) include alkyl and substituted methoxyethyl (including 2'-4 'constrained variants identified herein), peptide nucleic acid (PNA), locked nucleic acid (LNA) and morpholino (PMO) antisense oligonucleotides and ethylene-bridged nucleotides (ENA) and combinations thereof, optionally, RNase H-dependent antisense RNA chimera. 优选的寡核苷酸包含2'-0_取代的RNA硫代磷酸酯核苷酸，优选其中所述2'-0取代是甲氧基乙基（MOE)和/或甲基（Me)和/或2'0，4'C亚甲基桥（LNA)和/或2'0，4'C约束的乙基(cEt)和/或2，0，4，C约束的甲氧基乙基(cMOEt)(参考文献：Short Antisense Oligonucleotides with Novel 2' ~4' Conformationaly Restricted Nucleoside Analogues Analogues Show Improved Potency without Increased Toxicityin Animals, Punit P. Seth, Andrew Siwkowski, Charles R. Allerson, Guillermo Vasquez, Sam Lee, Thazha P. Prakash, Edward V. ffancewicz, Donna ffitchell,禾口Eric E. Swayze, J. Med. Chem.，2009，52 (1)，10-13)。 A preferred oligonucleotide comprises a 2'-0_-substituted RNA phosphorothioate nucleotides, preferably wherein the substituent is a 2'-0-methoxyethyl (MOE) and / or methyl (Me) and / 2'0,4'C or a methylene bridge (LNA) and / or constraints 2'0,4'C ethyl (cEt) and / or 2,0,4, C constrained methoxyethyl (cMOEt) (reference: Short Antisense Oligonucleotides with Novel 2 '~ 4' Conformationaly Restricted Nucleoside Analogues Analogues Show Improved Potency without Increased Toxicityin Animals, Punit P. Seth, Andrew Siwkowski, Charles R. Allerson, Guillermo Vasquez, Sam Lee, Thazha P. Prakash, Edward V. ffancewicz, Donna ffitchell, Wo port Eric E. Swayze, J. Med. Chem., 2009,52 (1), 10-13). 将锁核酸整合至所述寡核苷酸改变碱基配对后螺旋构象并且增加双链体稳定性。 Nucleic acid is integrated into the lock to change the base-paired oligonucleotides helical conformation and increase duplex stability. 整合LNA碱基至所述寡核苷酸序列可以因此用于增加本发明的互补寡核苷酸在体外和体内活化的能力，以增加RNA降解抑制转录本积累或增加外显子遗漏能力。 Integration LNA bases into the oligonucleotide sequence of the present invention may thus be used to increase the ability of complementary oligonucleotides in vitro and in vivo activation in order to increase RNA degradation inhibit the accumulation of transcripts or increase exon skipping capabilities. 肽核酸是人工DNA/RNA模拟物，其主链是假肽而不是糖，其具有通过增加的结合和较高解链温度与互补DNA寡聚体形成极稳定的复合体的能力。 Peptide nucleic acid is an artificial DNA / RNA analog thereof, the backbone is a pseudopeptide rather than a sugar, having the ability to form extremely stable complexes by increased binding and a higher melting temperature with the complementary DNA oligomer. PNA也是本发明中反义和外显子遗漏应用的优等试剂。 The present invention is also a PNA antisense and exon skipping applications excellent agent. 更优选地，用于本发明中方法的寡核苷酸至少部分或全部地包含2' -0-甲氧基硫代磷酸酯RNA核苷酸、2' -0-甲基硫代磷酸酯RNA核苷酸和/或锁核酸(LNA)。 More preferably, the oligonucleotide used in the method of the present invention at least partially or wholly contained 2 '-0- methoxy phosphorothioate RNA nucleotides, 2' -O-methyl phosphorothioate RNA nucleotides and / or locked nucleic acid (LNA). 甚至更优选地，寡核苷酸包含LNA和2' -0-甲基硫代磷酸酯RNA核苷酸或由其组成。 Even more preferably, LNA and oligonucleotides comprising 2 '-O-methyl phosphorothioate RNA nucleotides or consists. 在另一优选实施方案中，寡核苷酸包含LNA和硫代磷酸酯DNA核苷酸或由其组成。 In another preferred embodiment, LNA-containing oligonucleotides and phosphorothioate DNA nucleotides or consists. 在另一优选实施方案中，寡核苷酸包含LNA和2' -0-甲基硫代磷酸酯RNA核苷酸和硫代磷酸酯DNA核苷酸或由其组成。 In another preferred embodiment, LNA and oligonucleotides comprising 2 '-O-methyl phosphorothioate RNA nucleotides and phosphorothioate DNA nucleotides or consists. 在另一优选实施方案中，寡核苷酸包含LNA和2' -0-甲氧基乙基硫代磷酸酯RNA核苷酸或由其组成。 In another preferred embodiment, LNA and oligonucleotides comprising 2 '-0- methoxyethyl phosphorothioate RNA nucleotides or consists. 在另一更优选实施方案中，寡核苷酸由PMO寡核苷酸组成。 In another more preferred embodiment, the oligonucleotide consists of PMO oligonucleotide. 在另一优选实施方案中，寡核苷酸由2'-0-甲基硫代磷酸酯RNA核苷酸组成。 In another preferred embodiment, the oligonucleotide consists of 2'-O-methyl phosphorothioate RNA nucleotides. 最优选地，这些修饰应用于会通过其他机制而不是RNA酶H使突变mRNA分解或抑制的构型中。 Most preferably, these modifications can be applied through other mechanisms that the mutant enzyme but not H mRNA RNA decomposition or inhibition configuration. 最优选用于本发明中以用于顺式元件重复不稳定性遗传病症的诊断、治疗或预防的寡核苷酸包含与选自（CAG) n、（GCG) η、（CUG) η、（CGG) η、（CCG) η、（GAA) η、（GCC) η 禾Π (CCUG) η 的重复序列互补的序列或由其组成，长度为9-50，更优选为12-40，最优选为12-25个核苷酸，以及包含2' -0-甲氧基乙基硫代磷酸酯RNA核苷酸、2' -0-甲基硫代磷酸酯RNA核苷酸、LNA 核苷酸或PMO核苷酸。 Most preferred for use in the present invention for the diagnosis of cis-element repeat instability genetic disorders, treatment or prevention of selected oligonucleotide comprises (CAG) n, (GCG) η, (CUG) η, ( CGG) η, (CCG) η, (GAA) η, [eta] sequence repeats (GCC) η Wo Π (CCUG) or consist of complementary, length 9-50, more preferably 12-40, most preferably 12-25 nucleotides, and comprising 2 '-0- methoxyethyl phosphorothioate RNA nucleotides, 2' -O-methyl phosphorothioate RNA nucleotides, the LNA nucleotide or PMO nucleotides. 可选择地或与一个或多个之前定义的优选实施方案组合，本发明还具体地提供了包含只与基因转录本的重复序列互补的序列或由其组成的寡核苷酸，以及它制备用于治疗或预防人类顺式元件重复不稳定性相关的遗传病症药物的用途，并且该寡核苷酸是RNA酶H基本上非依赖的寡核苷酸。  Alternatively or in combination with one or preferably a plurality of embodiments of the previously defined, the present invention also specifically provides a composition comprising an oligonucleotide sequence complementary only to repeat the sequence of the gene transcript or therefrom, and it is for the treatment or prevention of a human cis-element repeat instability genetic disorders medicament-related uses, and the oligonucleotide is a RNAse H substantially independent RNA oligonucleotide. RNA酶H基本上非依赖的寡核苷酸优选定义为如下的寡核苷酸：结合于靶向的RNA 后基本上不能募集和/或激活RNA酶H。  Preferred definitions RNA oligonucleotide enzyme H substantially independent oligonucleotide is as follows: After binding to the targeted RNA is not substantially raised and / or activate the enzyme RNA H. RNA酶H的募集和/或激活可以通过将待测靶向的RNA和寡核苷酸与优选来自大肠杆菌（E coli)的RNA酶H接触后使用标准RNA酶H消化检测评价。 RNA RNase H recruitment and / or activation of RNA by RNase H to be measured after a targeted RNA oligonucleotide and preferably from Escherichia coli (E coli) contacting evaluated using standard RNA digestion enzyme detecting H. 这类检测为本领域技术人员所已知并且可以如Honcharenko D et al或Kurreck J et al (Honcharenko D et al, (2007), Biochemistry,46 :5635_5646，禾口Kurreck J et al (2002), Nucl. Ac. Res. ,30 :1911_1918)所描述的来实施。 These tests are known to those skilled in the art and may be as Honcharenko D et al or Kurreck J et al (Honcharenko D et al, (2007), Biochemistry, 46: 5635_5646, Wo port Kurreck J et al (2002), Nucl .. Ac Res, 30:. 1911_1918) to the embodiments described. 在本发明语境中，寡核苷酸或指定剂量或浓度的寡核苷酸优选所述基本不能募集和/或激活RNA酶H和/或所述基本上RNA酶H非依赖的寡核苷酸，当在以上定义的两种试验中的至少一种时，少于50%的靶向的RNA被消化。 In the context of the present invention, preferably an oligonucleotide or oligonucleotide concentrations of the indicated doses or not substantially raised and / or activate RNase H, and RNA / RNA or the substantially non-RNase H-dependent oligonucleotides acid, when two kinds of the above-defined test at least one of less than 50% of the targeted RNA is digested. 更优选地，少于45 %的靶向的RNA被消化，甚至更优选少于40 %、35 %、30 %、 25%,20%,15%,10%,5%或更少。 More preferably, less than 45% of the targeted RNA is digested, and even more preferably less than 40%, 35%, 30%, 25%, 20%, 15%, 10%, 5% or less. 最优选地，寡核苷酸或指定剂量或浓度的所述寡核苷酸不能募集和/激活RNA酶H。 Most preferably, the oligonucleotide, the oligonucleotide or a specified dose or concentration can not be raised and / RNA activating enzyme H. 在优选实施方案中，预期当寡核苷酸在浓度范围中使用时，其中所述寡核苷酸作为用于本文定义的所述疾病的药物，所述寡核苷酸基本上不能募集和/ 或激活RNA酶H和/或所述RNA酶H基本上非依赖的。 In a preferred embodiment, the oligonucleotide is expected when used in the concentration range, wherein said oligonucleotide as a medicament for the diseases as defined herein, does not substantially raise the oligonucleotide and / or activate RNase H, and RNA / RNA or RNase H substantially independent. 在这种情况下，优选在这类试验中没有检测到靶向的RNA的消化。 In this case, it is preferable not to digest the targeted RNA detected in such experiments. 这类寡核苷酸是RNA酶H非依赖的寡核苷酸。 Such oligonucleotides are non-RNase H-dependent RNA oligonucleotide. 迄今为止反义的许多形式已被描述包括降解靶mRNA的酶依赖机制例如RNA酶H活性。 So far many forms of antisense RNA has been described e.g. RNase H activity comprises enzymatic degradation of the target mRNA is dependent mechanism. RNA酶H只裂解RNA-DNA双链体并且因此为了下调mRNA，反义寡核苷酸应该包含脱氧核糖（DNA)核苷酸。 RNase H cleavage of RNA only RNA-DNA duplexes and thus to reduced mRNA, antisense oligonucleotides should contain deoxyribonucleotides (DNA) nucleotides. 轻微修饰例如使用硫代磷酸酯脱氧核糖核苷酸是被允许的以保留这种RNA酶H活性。 Minor modifications such as phosphorothioate deoxyribonucleotides are permitted to retain such RNA RNase H activity. 嵌合寡核苷酸（或寡聚体）由于其稳定的性质（提高生理稳定性或半衰期）已被使用，例如在寡核苷酸的3'和5'末端应用2' 0-烷基和2' 0-甲氧基乙基修饰。 Chimeric oligonucleotides (or oligomer) due to their stable nature (increase physiological stability or half-life) has been used, for example, in the oligonucleotide 3 'and 5' ends Applications 2 'O-alkyl and 2 '0- methoxyethyl modification. 然而，通过寡核苷酸-靶RNA双链体的RNA酶H募集，仍然需要脱氧核糖核苷酸延伸。 However, by oligonucleotide - RNase H recruitment RNA target RNA duplex, there remains a need to extend deoxyribonucleotides. 这些嵌合寡核苷酸（有或没有硫代磷酸酯主链修饰）被称为间断体（gapmer)(见W02007/089611)。 These chimeric oligonucleotides (with or without a phosphorothioate backbone modification) is referred to as intermittent member (a gapmer) (see W02007 / 089611). 人们相信这类（脱氧核糖）间断应该优选至少长为6个核苷酸并且更优选为长为10个核苷酸以便可以募集和/或激活RNA酶H。 It is believed that such (deoxyribose) should be preferably interrupted at least six nucleotides in length and more preferably 10 nucleotides in length so as to be recruitment and / or activation of the enzyme RNA H.
 因此，在本发明的优选实施方案中，寡核苷酸被设计为在结合于靶向的RNA后基本上不募集和/或激活RNA酶H。  Thus, in a preferred embodiment of the present invention, oligonucleotides are designed to not substantially raise after binding to a targeted RNA and / or RNA activating enzyme H. 本发明优选使用寡核苷酸（寡聚体），其优选基本上不能募集和/或激活RNA酶H。 Preferably the present invention using the oligonucleotides (oligomer), which is preferably not substantially raised and / or activate the enzyme RNA H. 这类寡核苷酸可以包含例如2' -0主链修饰，优选2' 0-烷基或2'0_甲氧基乙基、肽核酸（PNA)、锁核酸（LNA)或吗啡啉反义。 Such oligonucleotides may comprise, for example, 2 '-0 backbone modifications, preferably 2' O-alkyl or 2'0_ methoxyethyl, peptide nucleic acid (PNA), locked nucleic acid (LNA) or anti-morpholine righteousness. 这类寡核苷酸可以甚至是包含脱氧核苷酸的嵌合分子，但优选具有少于9个或最优选有少于6个脱氧核苷酸彼此相邻(连续脱氧核苷酸）。 Such oligonucleotides may even be a chimeric molecule comprising deoxyribonucleotides, but preferably has less than 9, or most preferably at less than 6 deoxynucleotides adjacent (consecutive deoxynucleotides). 惊人地，本发明证明RNA酶H基本上非依赖的寡核苷酸可被用于制备用于治疗或预防人类顺式元件重复不稳定性相关的遗传病症的药物。  Surprisingly, the present invention demonstrates RNA by RNAse H substantially independent oligonucleotide can be used for the treatment or prevention of a human cis-element repeat instability associated genetic disorder drugs. 所述RNA酶H基本上非依赖的寡核苷酸比相应的经典的RNA酶H依赖的寡核苷酸更有吸引力，因为我们能够合理地预期这类RNA酶H基本上非依赖的寡核苷酸比相应的RNA酶H依赖的对应物更容易被合成、毒性更小和更稳定。 The RNA enzyme H substantially independent oligonucleotide H-dependent than the corresponding classical RNA oligonucleotide enzyme more attractive, because we can reasonably expect such RNA RNase H substantially independent oligonucleotide easier than the corresponding nucleotide RNase H-dependent RNA counterpart is synthesized, less toxic and more stable. 因此，在优选实施方案中，提供了寡核苷酸和其用途，其中所述用途如上文所定义的，并且其中所述寡核苷酸长度为约9至约50个核苷酸，在其5'或3'末端的至少一个被取代并且在其序列的其余部分包含少于9，更优选少于6个的连续脱氧核糖。  Thus, in a preferred embodiment, there is provided an oligonucleotide and the use thereof, wherein the use as defined above, and wherein said oligonucleotide has a length of about 9 to about 50 nucleotides at its 5 'or 3' end and at least one is substituted in the rest of its sequence comprises less than 9, more preferably less than 6 consecutive deoxyribonucleotides. 寡核苷酸的更优选的长度已经在本文定义。 More preferably the length of the oligonucleotide have been defined herein. 优选的取代包括含硫代磷酸酯的主链。 Preferred substituents include sulfur-containing phosphorothioate backbones of. 优选的含硫代磷酸酯的主链包括2' -0-取代的RNA硫代磷酸酯核苷酸。 Backbone preferably comprises a sulfur-containing phosphorothioate 2 '-0- substituted RNA phosphorothioate nucleotides. 优选的2' -0-取代的RNA硫代磷酸酯核苷酸包括2' -0-取代的甲氧基乙基和/或甲基和/或2' 0，4' C亚甲基桥（LNA)和/或2，0，4，C约束的乙基(cEt)和/或2，0，4，C约束的甲氧基乙基(cMOEt)。 Preferred 2 '-0- substituted RNA phosphorothioate nucleotides include 2' -0- methoxyethyl substituted and / or methyl and / or 2 '0,4' C methylene bridge ( LNA) and / or 2,0,4, C constrained ethyl (cEt) and / or 2,0,4, C constrained methoxyethyl (cMOEt). 如本文定义的，寡核苷酸在其5'或3'末端的至少一个被取代并且在其序列的其余部分包含少于9、更优选少于6个的连续的脱氧核糖。  As defined herein, an oligonucleotide at its 5 'or 3' end and at least one is substituted in the rest of its sequence comprises less than 9, more preferably less than 6 consecutive deoxyribonucleotides. 所述序列的其余部分优选在序列的中心。 In the central portion of the remaining sequence is preferably the sequence. 在其5'或3'末端均被取代并且在其序列的中心包含9或更多个连续脱氧核糖的寡核苷酸被称为间断体（gapmer)。 They are substituted at their 5 'or 3' terminus and contains 9 or more consecutive deoxyribonucleotides oligonucleotide is referred to as intermittent member (a gapmer) sequence at its center. 间断体已在WO 2007/089611被详细描述。 Discontinuous body has been described in detail in WO 2007/089611. 间断体被设计为能够募集和/或激活RNA酶H。 Discontinuous body is designed to be able to recruit and / or activate the enzyme RNA H. 不希望被理论限制，相信RNA酶H通过结合于脱氧核糖形成的间断体的中心区域被募集和/或激活。 Without wishing to be bound by theory, it is believed RNA is RNase H recruitment and / or activation by binding to the central body region of discontinuity is formed deoxyribose. 本发明的RNA酶H基本上非依赖的寡核苷酸被设计为以便具有基本上不能募集和/或激活RNA酶H的中心区域。 RNA of the present invention RNase H substantially independent oligonucleotide is designed so as to have a central region substantially not recruitment and / or activation of RNase H is RNA. 在优选实施方案中， 本发明寡核苷酸的序列的其余部分，更优选其中心部分包含少于9、8、7、6、5、4、3、2、1或没有脱氧核糖。 In a preferred embodiment, the remainder of the oligonucleotide sequence of the present invention, the central portion thereof is more preferably comprises less than 9,8,7,6,5,4,3,2,1 or no deoxyribonucleotides. 因此，本发明的寡核苷酸优选如上文定义的部分至全部被取代。 Accordingly, the present invention is preferably part of an oligonucleotide as defined above substituted to all. 部分取代的优选意味着寡核苷酸包含其至少50 %的核酸已被取代，至少55 %、60 %、65 %、70 %、75 %、 80%、85%、90%、95%或100% (即全部)被取代。 Partially substituted oligonucleotide comprises preferably means at least 50% nucleic acid has been replaced, at least 55%, 60%, 65%, 70%, 75%, 80%, 85%, 90%, 95%, or 100 % (i.e., all) substituted. b)是单链寡核苷酸。  b) is a single-stranded oligonucleotide. b)是双链寡核苷酸。  b) is a double-stranded oligonucleotide. 在另一优选实施方案中，上述优选修饰会应用于通过其他机制而不是RNA酶H使突变mRNA分解的构型中。  In another preferred embodiment, the above modification will preferably be applied to other mechanisms, rather than RNA by RNase H that the configuration mutant mRNA decomposition. 如果，本发明涉及具有两条互补链的双链寡核苷酸，其反义链，只与人的基因转录本中的重复序列互补，这种双链寡核苷酸优选不是应用于培养的猴成纤维细胞（C0S-7)或人成神经细胞瘤（SH-SY5Y)细胞系的具有反义RNA链（CUG)7和有义RNA链（GCA)7WsiRNA,所述细胞或细胞系有或没有用融合了GFP的人亨廷顿基因外显子1转染，如Wanzhao Liu et al (Wanzhao Liu et al, (2003) ,Proc. Japan Acad, 79 :293_298)所描述的。  If, according to the present invention relates to a double-stranded oligonucleotide with two complementary strands, the antisense strand, only with the human gene transcript complementary to repetitive sequences of this, this double stranded oligonucleotide is preferably not applied in cultured monkey fibroblast (C0S-7) or human neuroblastoma (SH-SY5Y) cell lines with antisense RNA strand (CUG) 7 and sense RNA strand (GCA) 7WsiRNA, the cell or cells system with or without the use of GFP fusion foreign human Huntington gene exon 1 transfected as Wanzhao Liu et al (Wanzhao Liu et al, (2003), Proc Japan Acad, 79:. 293_298) described. 更优选地, 本发明即不涉及双链寡核苷酸siRNA(反义链为（CUG)7和有意义链为（GCA)7),也不涉及其制备用于治疗或预防亨廷顿病、甚至更优选用于治疗或预防包含亨廷顿病基因外显子1构建体的药物的用途。 More preferably, the present invention relates to a double-stranded oligonucleotide that is not siRNA (the antisense strand of (CUG) 7 and sense chain (GCA) 7), which does not involve preparation for treating or preventing Huntington's disease, and even more preferably for treating or preventing disease comprising the use of an outer Huntington gene exon 1 of the drug construct. 尽管使用单寡核苷酸可以充分地减少诸如核积累的DMPK或ZNF9转录本或其片段的重复扩增的转录本的数量，或充分地减少重复扩增的HD蛋白质的积累，组合2、3、4、5或更多寡核苷酸也在本发明的范围内。  While the use of a single oligonucleotide may be sufficient to reduce the number of repeat expanded transcripts, such as nuclear accumulated DMPK or ZNF9 transcripts or fragments thereof, or substantially reduce the accumulation of repeat expanded HD protein, a combination of 4, 5, or more oligonucleotides are also within the scope of the present invention. 包含与转录本重复部分互补的序列或由其组成的寡核苷酸可以有利地与另一寡核苷酸组合，所述另一寡核苷酸包含与含重复的转录本的独特序列互补和/或能够与之杂交的序列或由其组成。 Comprises a sequence portion complementary to a transcription or by repeating this oligonucleotide may advantageously be combined with another oligonucleotide, said oligonucleotide further comprises a sequence complementary to a unique repeat containing transcripts and / or a sequence capable of hybridizing thereto or its components. 如本文前面定义的，本发明包括含有次黄嘌呤核苷和/或尿嘧啶和/或含有能形成摆动碱基对的碱基的核苷和优选RNA酶H基本上非依赖的寡核苷酸的用途。 As defined earlier herein, the present invention includes a inosine and / or uracile and / or containing a base able to form a wobble base pair RNA nucleosides and preferably RNAse H substantially independent oligonucleotide the use of. 本发明也包括将含有次黄嘌呤核苷和/或尿嘧啶和/或含有能形成摆动碱基对的碱基的核苷的寡核苷酸与为RNA酶H基本上非依赖的寡核苷酸另一寡核苷酸组合使用。 The present invention also encompasses containing inosine and / or uracile and / or a nucleotide containing a wobble base capable of forming a base pair with an RNA oligonucleotide RNAse H substantially independent oligonucleotide another acid oligonucleotide combinations. 包含重复特异性寡核苷酸的本发明的方法和本发明的药物也可以与任何其他针对顺式元件重复不稳定性遗传病症的治疗或药物组合。 The method of the present invention comprising repeat specific oligonucleotides and medicaments of the invention may be combined with any other treatment or medicament repeat instability genetic disorders for cis-element. 出于诊断目的，包含次黄嘌呤核苷和/或尿嘧啶和/或含有能形成摆动碱基对的碱基的核苷、优选RNA酶H基本上非依赖的和用于本发明方法中的寡核苷酸可以带有放射性标记或荧光标记以允许在样品、细胞、体内原位细胞、离体或体外检测转录本。  For diagnostic purposes, comprising an inosine and / or uracil, and / or contain nucleotide able to form a wobble base pair is a base, preferably a substantially non-RNA-dependent RNase H used in the present invention, and the method of oligonucleotide may be labeled with a fluorescent or radioactive label to allow the sample, cells, cells in situ in vivo, ex vivo or in vitro detection of transcripts. 对于强直性肌营养不良，标记的寡核苷酸可被用于诊断目的，用于DMPK或ZNF9RNA转录本分子和相关蛋白质的核聚集体的可视化。 For myotonic dystrophy, labeled oligonucleotides may be used for diagnostic purposes, for visualization of nuclear aggregates of DMPK transcripts or ZNF9RNA molecules and related proteins. 荧光标记可以包括CY3、CY5、FITC、TRITC、若丹明(Rhodamine)、GFP和其他类似物。 Fluorescent labels may include CY3, CY5, FITC, TRITC, Rhodamine (Rhodamine), GFP, and other like. 放射性标记可以包括3H、35S、32Λ3ρ、125I。 Radiolabels may include 3H, 35S, 32Λ3ρ, 125I. 酶和/或免疫原性半抗原例如地高辛、生物素和其他分子标签（HA、Myc、FLAG、VSV、IexA)也可以使用。 Enzymes and / or immunogenic haptens e.g. digoxigenin, biotin and other molecular tags (HA, Myc, FLAG, VSV, IexA) may also be used. 因此，在另一方面，本发明公开了体外或离体检测和/或诊断方法，其中使用了如上文定义的包含次黄嘌呤核苷和/或尿嘧啶和/或含有能形成摆动碱基对的碱基的核苷以及优选RNA 酶H基本上非依赖的寡核苷酸。 Thus, in another aspect, the present invention discloses an in vitro and / or ex vivo method of diagnosis or detection, and, where as defined above comprising an inosine and / or uracil, and / or capable to form a wobble base pair containing nucleosides and bases preferably RNAse H substantially independent RNA oligonucleotide. 包含次黄嘌呤核苷和/或尿嘧啶和/或含有能形成摆动碱基对的碱基的核苷、优选RNA酶H基本上非依赖的以及按照本发明使用的寡核苷酸适用于直接给药至受顺式元件重复不稳定性遗传病症侵袭或有发展为该病症风险的个体体内的细胞、组织和/或器官， 以及可以直接进行体内、离体或体外给药。  oligonucleotide comprising an inosine and / or uracile and / or a nucleotide containing a base able to form a wobble base pair, preferably a substantially non-dependent RNA RNase H and oligonucleotides according to the present invention, the nucleotide used suitable for direct administration to a subject cis-element repeat instability genetic disorders invasion or body of an individual risk of developing a condition for cells, tissues and / or organs, and can be directly in vivo, ex vivo or in vitro administration. 可选择地，所述寡核苷酸可以通过能够使人的细胞表达所述寡核苷酸的核酸载体提供，以允许所述寡核苷酸的持续来源。 Alternatively, the oligonucleotides of the oligonucleotide may be provided by a nucleic acid vector capable of expressing cells make, to allow the continuing source of nucleotides oligonucleotide. 可以将本发明的寡核苷酸分子以表达载体形式提供给待治疗的细胞、组织、器官和/或受试者，所述表达载体能够使人的细胞表达所述寡核苷酸。 Oligonucleotide molecule of the present invention may be provided to be treated in the form of an expression vector cell, tissue, organ and / or subject, the expression vector capable of expressing cells makes the oligonucleotide. 优选通过基因递送媒介将载体导入细胞。 By gene delivery vehicle it is preferably a vector into a cell. 优选用于递送的媒介是病毒载体例如逆转录病毒载体、腺相关病毒载体（AAV)，腺病毒载体、赛姆利基森林病毒载体（Semliki Forest virus vectors) (SFV)、EBV载体等。 Preferred media for delivery are viral vectors such as retroviral vectors, adeno-associated virus vector (the AAV), adenoviral vectors, viral vectors 赛姆利基森林 (Semliki Forest virus vectors) (SFV), EBV vectors and the like. 质粒、人工染色体、 适用于在人的细胞基因组中进行靶向同源重组和整合的质粒也可以适用于递送寡核苷酸。 Plasmids, artificial chromosomes, suitable for targeted homologous recombination and integration of the plasmid in the human genome of cells may be suitable for delivery of oligonucleotides. 优选用于本发明的是那些其中转录受polIII启动子驱动，和/或其中转录本是与Ul或U7 转录本融合的形式的载体，其在递送小转录本时产生好的效果。 Preferably used in the present invention are those, and / or wherein transcripts are in the form of a carrier with Ul or U7 transcripts fused, which is generated when delivering small transcripts by the good results which transcription polIII promoter. 15约1 μ M。 15 from about 1 μ M. 更优选地，使用浓度范围为约0. 3至约400ηΜ，甚至更优选地，约1至约200ηΜ。 More preferably, a concentration ranging from about 0.3 to about 400ηΜ, even more preferably, from about 1 to about 200ηΜ. 优选的浓度为0. Inm至1 μ Μ。 A preferred concentration of 0. Inm to 1 μ Μ. 更优选地，使用浓度为0. 3至400ηΜ，甚至更优选地1至200ηΜ。 More preferably, a concentration of 0.3 to 400ηΜ, even more preferably 1 to 200ηΜ. 如果使用了数种寡核苷酸，这一浓度可以指寡核苷酸的总浓度或加入的每种寡核苷酸的浓度。 If several oligonucleotides used, this concentration may refer to the total concentration of oligonucleotides or oligonucleotide added to each concentration. 如上文给出的寡核苷酸的浓度范围是在体外或离体使用的优选浓度。 As the oligonucleotide concentration range given above are preferred concentrations in vitro or ex vivo use. 本领域技术人员会理解取决于使用的寡核苷酸、待治疗的靶细胞、靶基因和其表达水平，使用的培养基和转染与孵育条件，使用的寡核苷酸的浓度还可以变化并且可能需要进一步优化。 Those skilled in the art will appreciate that depending on the oligonucleotide, the target cells to be treated, the gene target and its expression levels, the medium, and incubated with the transfection conditions used, the concentration of oligonucleotide used may also be varied and may need further optimization. 更优选地，包含次黄嘌呤核苷和/或尿嘧啶和/或含有能形成摆动碱基对的碱基的核苷、优选RNA酶H基本上非依赖的和用于本发明以预防、治疗或诊断顺式元件重复不稳定性病症的寡核苷酸通过合成制备，并且以药学上可接受的组合物的制剂形式直接给予细胞、组织、器官和/或患者或个体或受试者。  More preferably, the oligonucleotide comprising an inosine and / or uracile and / or a nucleotide containing a base able to form a wobble base pair, preferably RNA RNase H substantially independent and used in the present invention in prevention, treatment or diagnosis of cis-element repeat instability disorder prepared by oligonucleotide synthesis, and the formulation in the form of pharmaceutically acceptable compositions administered directly to cells, tissues, organs and / or patient or subject or test By. 将所述药物组合物递送至受试者优选通过一种或多种肠胃外注射实施，例如静脉内的和/或皮下的和/或肌肉内的和/或鞘内的和/或脑室内的给药，优选在人体的一个或多个部位注射。 The pharmaceutical composition is preferably delivered to a subject by parenteral injection of one or more embodiments, for example, and / or subcutaneous and / or and / or intrathecal and / or intraventricular intramuscular of intravenous administration, preferably injection in one or more parts of the body. 鞘内或脑室内给药（在脑脊髓流体中） 优选通过向受试者体内引入扩散泵实现。 Intrathecal or intraventricular administration (in the cerebrospinal fluid) is preferably realized by introducing a diffusion pump into the subject. 数种扩散泵对于本领域技术人员是已知的。 Several diffusion pumps of ordinary skill in the art are known. 包含与本文定义的重复序列互补的序列或由其组成的用于靶向寡核苷酸分子的药物组合物可以包含多种赋形剂例如稀释剂、填充剂、防腐剂、增溶剂等，这些可以在例如The Science and Practice of Pharmacy (制药科学与实践），第20 版· Baltimore，MD : Lippincott Williams & ffilkins,2000 中找到。  comprising a sequence complementary to a repetitive sequence as defined herein or a pharmaceutical composition therefrom for targeting composition may comprise an oligonucleotide molecule more excipients such as diluents, fillers, preservatives, solubilizers etc., which can, for example, the Science and practice of pharmacy (pharmaceutical Science and practice), 20th Edition · Baltimore, MD:, in 2000 found Lippincott Williams & ffilkins. 本发明的方法特别地优选使用可以辅助递送所述寡核苷酸至细胞和进入细胞的赋形剂，特别是能够形成将复合于或捕获于泡囊或脂质体的物质和/或寡核苷酸递送通过细胞膜的复合物、泡囊和/或脂质体的赋形剂。  The method of the present invention is particularly preferable to use excipients assisted delivery of the oligonucleotide to cells and polynucleotide into a cell, particularly a substance capable of forming a vesicle or liposome or trapped in the composite and to / or an oligonucleotide delivery complex membrane by vehicles, vesicles and / or liposomes. 许多这种物质在本领域内是已知的。 Many of these substances are known in the art. 合适的物质包括聚乙烯基亚胺（PEI)、ExGen 500、合成的两性分子（SAINT-18)、lipofectinTM、 DOTAP和/或能自我装配成微粒的病毒壳体蛋白质，其能够递送所述寡核苷酸至细胞。 Suitable materials include polyethylene imine (PEI), ExGen 500, synthetic amphiphilic molecules (SAINT-18), lipofectinTM, DOTAP and / or self-assemble into a viral capsid protein particles, which is capable of delivering the oligonucleotide nucleotide to the cells. Lipofectin代表脂质体转染剂的实例。 Lipofectin liposomes Representative examples of transfection agents. 其由两种脂质组分组成，阳离子脂质N_[l_(2，3 二油酰氧）丙基]-N，N, N-三甲基氯铵（DOTMA) (cp. D0TAP，其为甲基硫酸盐）和中性脂质二油酰基磷脂酰乙醇胺（dioleoylphosphatidylethanolamine) (DOPE)。 Which consists of two lipid components, a cationic lipid N_ [l_ (2,3 dioleoyloxy) propyl] -N, N, N- trimethylammonium chloride (DOTMA) (cp. D0TAP, which is methyl sulfate) and the neutral lipid dioleoyl phosphatidylethanolamine (dioleoylphosphatidylethanolamine) (DOPE). 中性组分介导细胞内释放。 Neutral component mediates the intracellular release. 另一组递送系统是聚合纳米粒。 Another group of delivery systems are polymeric nanoparticles. 众所周知为DNA转染试剂的如二乙氨基乙氨基乙基(DEAE)-葡聚糖（di ethyl amino ethylaminoethyl (DEAE)-dextran)之类的聚阳离子，可以与氰基丙烯酸丁酯（PBCA)和氰基丙烯酸己酯（hexylcyanoacrylate) (PHCA)结合形成能够递送寡核苷酸透过细胞膜进入细胞的阳离子纳米粒。 As is well known aminoethyl diethylaminoethyl (DEAE) DNA transfection reagent - polycation dextran (di ethyl amino ethylaminoethyl (DEAE) -dextran) or the like, it may be butyl cyanoacrylate (PBCA) and cyano-hexyl acrylate (hexylcyanoacrylate) (PHCA) to form an oligonucleotide capable of delivering into a cell through the cell membrane of the cationic nanoparticles. 除了这些常用的纳米粒之外，阳离子肽鱼精蛋白提供了可选择的途径以将寡核苷酸配制成胶体。 In addition to these common nanoparticle, cationic peptide protamine offers an alternative approach to formulate oligonucleotides as colloids. 这种胶体纳米粒系统可以形成所谓的蛋白微粒（proticles)，其可通过简单的自我装配过程制备以包裹和介导本文定义的寡核苷酸在细胞内释放。 This colloidal nanoparticle system can form so-called protein particles (proticles), which can be prepared by parcel oligonucleotides and mediate defined herein by a simple self-assembly process nucleotide intracellular release. 本领域技术人员可以选择和调整任何上述或其他可商购的可选择的赋形剂和递送系统以包裹和递送用于本发明的寡核苷酸以递送用于治疗人类顺式元件重复不稳定性病症的这类寡核苷酸。 Those skilled in the art can select and adjust any of the above or other commercially available alternative excipients and delivery systems to package and deliver oligonucleotides for the present invention to deliver nucleotide for treating a human cis-element repeat instability such disorders oligo nucleotides. 另外，包含次黄嘌呤核苷和/或尿嘧啶和/或含有能形成摆动碱基对的碱基的核苷和优选RNA酶H基本上非依赖的寡核苷酸可以共价或非共价连接于经特异设计以促进摄入细胞、细胞质和/或其核的靶向配体。  Further, the oligonucleotide comprising an inosine and / or uracil, and / or contain nucleotide able to form a wobble base pair RNA bases and preferably RNAse H substantially independent oligonucleotide may be covalently or non-covalent attachment to the cell uptake, cytoplasm and / or nuclear targeting ligand specifically designed to facilitate through. 这类配体可以包括（i)识别细胞、组织或器官特异元件、促进细胞摄入的化合物（包括但不仅限于肽（样）（结构）和/或（ii)能够促进寡核苷酸摄入至细胞和/或从泡囊例如内体或溶酶体细胞内释放的化学化合物。这类靶向配体也包括促进寡核苷酸通过血液脑屏障摄入至脑中的分子。 Such ligands may comprise (i) identifying a cell, tissue or organ specific elements, to promote cellular uptake of the compound (including but not limited to peptide (comp) (structure) and / or (ii) an oligonucleotide capable of promoting uptake to a cell and / or from e.g. endosomal vesicles or lysosomes of cells release chemical compounds. such targeting ligands also includes molecules facilitate oligonucleotide uptake into the brain through the blood brain barrier. 因此，在优选实施方案中，包含次黄嘌呤核苷和/或尿嘧啶和/或含有能形成摆动碱基对的碱基的核苷以及优选为RNA酶H基本上非依赖的寡核苷酸是药物的一部分或被视为药物并且被提供至少一种赋形剂和/或用于递送的靶向配体和/或递送所述寡核苷酸至细胞和/或增强其细胞内递送的递送装置。  Thus, in a preferred embodiment, the oligonucleotide comprising an inosine and / or uracile and / or containing a base able to form a wobble base pair RNA nucleosides RNase H and is preferably substantially independent oligonucleotide nucleotide is regarded as part of a drug or medicament and is provided with at least one excipient and / or targeting ligand for delivery and / or delivery of the oligonucleotide to cells and / or enhance its cellular within the delivery of the delivery device. 因此，本发明也包括包含本发明的寡核苷酸并且还包含至少一种赋形剂和/或用于递送的靶向配体和/或递送所述寡核苷酸至细胞和/ 或增强其细胞内递送的递送装置的药学上可接受的组合物。 Accordingly, the present invention also includes oligonucleotides comprising the present invention and further comprising at least one excipient and / or targeting ligand for delivery and / or delivery of the oligonucleotide to cells and / or enhanced pharmaceutically acceptable compositions delivery device its intracellular delivery. 本发明也涉及用于减少细胞内包含重复的基因转录本的方法，其包括单链或双链寡核苷酸的给药，所述寡核苷酸包含次黄嘌呤核苷和/或尿嘧啶和/或含有能形成摆动碱基对的碱基的核苷、优选为RNA酶H基本上非依赖的以及优选包含2' -0-取代的RNA硫代磷酸酯核苷酸例如2' -0-甲基或2' -0-甲氧基乙基RNA硫代磷酸酯核苷酸或LNA或cET 或cMOE核苷酸或PMO核苷酸，并且具有只与重复序列互补的9-50个核苷酸的长度。  The present invention also relates to a method of gene transcripts comprising repeating intracellular reduction, which comprises administering a single or double stranded oligonucleotide, the oligonucleotide comprising an inosine and / or uracil, and / or capable of forming nucleobase containing a wobble base pair, preferably RNAse H substantially independent RNA and preferably comprise 2 '-0- substituted RNA phosphorothioate nucleotides such as 2 '-O-methyl or 2' -0- methoxyethyl phosphorothioate RNA nucleotides or LNA nucleotides or cET or cMOE or PMO nucleotides, and having only a complementary repeat sequence 9- 50 nucleotides in length. 所述核苷酸可以组合和/或与DNA硫代磷酸酯核苷酸一起使用。 The nucleotides can be used in combination and / or with DNA phosphorothioate nucleotides. 在本文和其权利要求中，动词“包含”和其词形变化以其非限定意义使用，意指包括该词之后的项目，但并不排除没有具体提及的组合和/或项目。  Herein and in the claims, the verb "comprise" and its conjugations is used in its non-limiting sense to mean that items following the word are included, but do not preclude no combinations and / or items specifically mentioned . 另外动词“组成为（to consist) ”可以被“基本由...组成”替代，意指本文定义的分子或基于病毒的载体或组合物除具体鉴定的组分还可以包含额外的组分，所述额外的组分不改变本发明的独特特征。  Further the verb "composition (to consist)" may be "substantially consisting of ..." Alternatively, as defined herein means a molecule or a viral-based vector or composition in addition to components specifically identified may further comprise additional component, additional components of the unique features of the present invention does not change. 优选地，单词“约（about)，，或“大约（approximately)，，与数值联用时（约10)意指该值可以是比给定值10大或小的值。  Preferably, the word "about (about) ,, or" about (approximately) ,, when used in combination with the value (about 10) means that the value may be than a given value 10 is large or small value. 另外，通过不定冠词“一个（a)”或“一个（an)”提及的元素并不排除多于一个元素存在的可能性，除非上下文明确地要求为一个并且只有一个元素。  Further, by the indefinite articles "a (A)" or "a (AN)" mentioned element does not exclude the possibility that more than one element, unless the context clearly requires is one and only one element. 因此不定冠词“a”或"an"通常意味着“至少一个”。 The indefinite article "a" or "an" usually means "at least one." 通过下面的实施例进一步说明本发明，这些实施例不应被解释为限制本发明的范围。  The invention is further illustrated, by the following examples of these embodiments are not to be construed as limiting the scope of the invention. Sl ：显示以不同浓度的寡核苷酸PS58或PS142处理后DM500肌管中浓度应答曲线。  Sl: show various concentrations of oligonucleotide PS58 or concentration-response curve PS142 DM500 myotubes treated. 寡（核糖）核苷酸PS58显示出全长2'0_甲基硫代磷酸酯修饰的主链以及寡（脱氧核糖）核苷酸PS142显示全长硫代磷酸酯DNA主链。 Oligo (ribo) nucleotide PS58 exhibits full length 2'0_ methyl phosphorothioate modified backbones, and oligonucleotides (deoxyribonucleotides) show the full-length nucleotide PS142 DNA phosphorothioate backbones. PS58比PS142更有效地抑制突变扩增的hDMPK转录本。 PS58 to more effectively suppress the amplified mutant hDMPK transcripts than PS142. PS58，不像PS142，包含通过寡核苷酸防止RNA酶H介导的靶mRNA降解的2' OMe修饰。 PS58, unlike PS142, prevented by oligonucleotide comprising 2 'OMe RNA modified RNase H mediated degradation of the target mRNA. hDMPK的表达通过Northern印迹分析随后以磷光显像仪分析定量。 Followed by quantitative phosphor imager analysis of hDMPK expression by Northern blot analysis. 所述信号用GAPDH信号标准化并且相对于模拟（mock)处理后的应答表示。 The GAPDH signal normalized with respect to the analog signal (the mock) represents the response after treatment. 对来自患亨廷顿病的男性患者的GM00305成纤维细胞用寡核苷酸PS57 (CUG) 7或PS261 (CIG) 7在不同浓度处理后进行RT-PCR分析。  on GM00305 fibroblasts from a male patient suffering from Huntington's disease. 7 RT-PCR was analyzed after treatment with different concentrations of oligonucleotide PS57 (CUG) 7 or PS261 (CIG). GM00305的分析显示了代表突变（扩增的疾病）等位基因和正常等位基因的转录本的两种RT-PCR产物。 Analysis of GM00305 shows the representative mutant (expanded disease) in two RT-PCR products of allele transcripts and the normal allele. PS57和PS261显示剂量依赖的对突变转录本的抑制。 PS57 and PS261 showed a dose-dependent inhibition of the mutant transcript. 图3 ： 对来自患亨廷顿病的男性患者的GM00305成纤维细胞或来自健康志愿者的PAFCl 成纤维细胞用寡核苷酸PS262(UGC)7在不同浓度处理后进行RT-PCR分析。  Figure 3:  on GM00305 fibroblasts from a male patient suffering from Huntington's disease or from healthy volunteers PAFCl fibroblasts oligonucleotide PS262 (UGC) 7 carried out after treatment with different concentrations RT- analysis of PCR. 对照处理的GM00305分析显示了代表突变（扩增的疾病）等位基因和正常等位基因的转录本的两种RT-PCR产物，而PAFCl细胞的分析显示了一种RT-PCR产物，表示两个正常等位基因的转录本。 Analysis of GM00305 shows representative of control-treated mutant (expanded disease) in two RT-PCR products of allele transcripts and the normal allele, and cells analyzed PAFCl shows a RT-PCR products, represented by two transcripts of the normal allele. PS262对GM00305中突变转录本比对GM00305或PAFCl中正常转录本显示更有效的抑制。 PS262 mutant transcript pair GM00305 more effective inhibition than the normal transcript in GM00305 or PAFCl present display. 突变转录本的RT-PCR产物（来自图2和图3也描述的实验）的水平确定为与正常转录本的比，并且表示为对照处理（设为100%)的百分比。  The level of mutant transcript by RT-PCR products (from experiments also described in FIG. 2 and FIG. 3) is determined as a ratio to the normal transcript and expressed as a control treatment (set to 100%) percentage. 本图描述在GM00305细胞中用不同浓度的PS262 (方块）、PS57 (圆形）和PS261 (三角形）处理后突变比正常等位基因转录本的浓度依赖的减少。 This figure depicts various concentrations GM00305 cells with PS262 (squares), PS57 after (circles) and PS261 (triangles) treated normal allele mutant transcript present in a concentration-dependent decrease. 对来自患亨廷顿病的男性患者的GM00305成纤维细胞用寡核苷酸PS57处理4h后进行RT-PCR分析。  on GM00305 fibroblasts from a male patient suffering from Huntington's disease oligonucleotide PS57 performed RT-PCR analysis after 4h treatment. 处理开始后的24h(圆形）或48h(菱形）时收集细胞。 24h (circles) or 48h after treatment start when the cells were collected (diamonds). 突变转录本的RT-PCR产物的水平确定为与正常转录本的比，并且表示为对照处理（设为100% )的百分比。 RT-PCR products horizontal mutant transcript determined than the normal transcript and expressed as percentage of control treatment (set to 100%). 本图描述在PS574h处理时段开始之后的24h(圆形）或48h(菱形）时突变比正常等位基因转录本的浓度依赖的减少。 This is described in FIG. 24h after treatment period starts PS574h mutant alleles than normal concentration dependent decrease transcription when present (circles) or 48h (diamonds). 对来自患亨廷顿病的男性患者的GM00305成纤维细胞用寡核苷酸PS278或PS277 或对照处理后进行RT-PCR分析。  on GM00305 fibroblasts from a male patient with Huntington's disease suffering oligonucleotide or RT-PCR analysis of the control treated PS278 or PS277. PS278和PS277原则上均是结合于靶mRNA时能够激活RNA 酶H的间断体（只在寡核苷酸的3'和5'末端包含2' 0-甲基取代的嵌合体的）。 RNA capable of activating RNase H when the PS278 and PS277 principle bind to the target mRNA are intermittent member (only the oligonucleotide at the 3 'and 5' ends comprise 2 'O-methyl substituted chimeric). PS277包括单个错配。 PS277 includes a single mismatch. GM00305的分析显示了两种RT-PCR产物，其表示源自突变（扩增的疾病）等位基因和正常等位基因的转录本。 Analysis of GM00305 shows two RT-PCR product, which represents a transcript derived mutant (expanded disease) allele and the normal allele. GM00305中突变转录本的RT-PCR产物（来自图2和图6也描述的实验)的水平确定为与正常转录本的比，并且表示为对照处理（设为100%)的百分比。  (from experiments also depicted in FIG. 2 and FIG. 6) of the mutant transcript in GM00305 RT-PCR product was determined as the ratio of the level of the normal transcript and expressed as percentage of control treatment (set to 100%). 本图描述在用50nM PS57(封闭柱）、PS278(条点柱）和PS261(条纹柱）处理后突变比正常等位基因转录本的浓度依赖的减少。 This is described using FIG 50nM PS57 (closed columns), PS278 (striate column) and less than that concentration dependent mutant allele transcripts of normal after treatment PS261 (striped bars). 图8显示了用200nM寡核苷酸PS259 (有可选择的起始核苷酸)或200nM寡核苷酸PS261(包含替代腺苷（A)的次黄嘌呤核苷（I))处理后DM500肌管中hDMPK mRNA水平(实心柱）。  FIG. 8 shows with 200nM oligonucleotide PS259 (with a selectable starting nucleotide) or 200nM oligonucleotide PS261 (inosine (I) containing an alternative adenosine (A) a) DM500 myotubes after treatment hDMPK mRNA levels (filled bars). hDMPK的表达通过Northern印迹分析随后以磷光图像仪分析定量。 Followed by quantitative phosphor imager analysis of hDMPK expression by Northern blot analysis. 所述信号用GAPDH信号标准化并且相对于模拟处理后的应答表示。 And representing the signal response with respect to the analog processing signal normalized with GAPDH. 以PS259或PS261处理导致hDMPK mRNA水平减少。 PS259 or PS261 treatment resulted in a reduction hDMPK mRNA levels. 实心柱描述hDMPK和空心柱描述m (鼠）DMPK ；mDMPK不包含三联核苷酸重复区域。 Solid bars and open bars described description hDMPK m (murine) DMPK; mDMPK does not comprise a nucleotide triplet repeat region. 18处理均专门针对重复的重复序列，与有效的寡核苷酸PS58相比并不导致hDMPK mRNA水平的减少。 Repeat treatments specifically for 18 repeats as compared with effective oligonucleotide PS58 not lead to a reduction of the level of hDMPK mRNA. 本领域技术人员已知的技术从DM500小鼠取得永生成肌细胞细胞系。  known to those skilled in the art from the DM500 mouse obtain immortalized myoblast cell line. DM500小鼠源自从巴黎的古尔东（de Gourdon)组获得的小鼠。 DM500 mice were derived from mice obtained from Gourdon (de Gourdon) group in Paris. 在DMPK基因中具有约500的不定（CTG) η重复长度的永生成肌细胞细胞系DM500生长至近汇合并且在5% CO2气体中于33°C下维持在0. 1 %明胶包被的器皿中。 Having uncertain about 500 in the DMPK gene (CTG) η repeat length immortalized myoblast cell lines DM500 grown to near confluence and maintained in 0.1% gelatin-coated vessel was in the 5% CO2 gas at 33 ° C . 成肌细胞在添加了20% FCS、50 μ g/mL庆大霉素和20单位的Y-干扰素/mL的DMEM里近汇合生长。 Myoblasts added 20% FCS, DMEM Y- interferon 50 μ g / mL gentamicin and 20 units / mL in the near confluent growth. 通过在Matrigel (BD Biosciences)包被的器皿上生长成肌细胞以及将汇合的成肌培养物在37°C置于添加了5%马血清和50 μ g/mL庆大霉素的DMEM中诱导肌管形成。 And by growing myoblast confluent myoblast cultures on Matrigel (BD Biosciences) packets vessel was placed in a 37 ° C supplemented with 5% horse serum and 50 μ g / mL gentamicin induce DMEM myotube formation. 在这种低血清培养基中5天后，收缩的肌管在培养物中产生并且以所需寡核苷酸转染。 After 5 days, shrinkage generated and myotubes transfected with the desired oligonucleotides in the culture in this low serum media. 对于转染，将NaCl (500mM过滤灭菌）、寡核苷酸和转染试剂PEI (ExGen 500,Fermentas)以这一特定顺序加入并且直接混合。 For transfection NaCl (500mM filter sterilized), oligonucleotide and transfection reagent PEI (ExGen 500, Fermentas) were added in this specific order and directly mixed. 根据说明书（ExGen 500， Fermentas)，寡核苷酸转染溶液包含比例为每μ g寡核苷酸5 μ 1的EXGen500。 According to the instructions (ExGen 500, Fermentas), the oligonucleotide transfection solution contained a ratio of oligonucleotide per μ g 5 μ 1 of EXGen500. 室温孵育15 分钟后，将寡核苷酸转染溶液加入至含有培养的肌管的低血清培养基并且轻轻混合。 After incubation for 15 minutes at room temperature the oligonucleotide transfection solution was added to the low serum medium containing the cultured myotubes and gently mixed. 最终寡核苷酸浓度范围为10pM-600nM。 The final oligonucleotide concentration in the range of 10pM-600nM. 模拟对照处理用不含寡核苷酸的转染溶液实施。 Mock control treatment containing no oligonucleotide transfection solution embodiment. 在37°C 孵育4小时后，将新鲜培养基加入至培养物（导致约2. 3倍稀释）并且于37°C延长孵育过夜。 After 37 ° C for 4 hours, fresh medium was added to the culture (resulting in a dilution of about 2.3-fold) and extension at 37 ° C for overnight. 次日，移去含有寡核苷酸的培养基并且将新鲜的低血清培养基加至在37°C再保持培养一天的肌管。 The next day, the medium containing the oligonucleotide was removed and fresh low serum medium was added at 37 ° C until the culture was kept day myotubes. 将寡核苷酸加至肌管培养物后48小时（即换为低血清条件以诱导肌管形成后七天），用“总RNA微量试剂盒(Total RNA mini kit)” (Bio-Rad)分离和制备RNA用于Northern印迹和RT-PCR分析。 The oligonucleotides were added to 48 hours after myotube cultures (i.e. change after seven days to induce myotube formation to low serum conditions), with the "Total RNA mini kit (Total RNA mini kit)" (Bio-Rad) isolated RNA was prepared and Northern blots and RT-PCR analysis. Northern印迹是与放射性人DMPK (hDMPK)探针和鼠GADPH 探针杂交。 Northern blots with a radioactive human DMPK (hDMPK) probe and a mouse GADPH probe hybridization. 用于DMPK的探针是由具有全3' UTR和11个CTG的DMPK开放阅读框组成的人DMPK cDNA。 Probes for DMPK is a human DMPK with full 3 'UTR of DMPK CTG 11 and an open reading frame consisting of cDNA. 人和鼠DMPK信号用磷光图像仪分析定量并且以GAPDH信号进行标准化。  The human and mouse DMPK signal quantified using a phosphor imager analysis and normalized to GAPDH signal. 图1描述寡核苷酸PS58和PS142对hDMPK信号的浓度依赖的抑制作用。  Figure 1 depicts the inhibition oligonucleotide PS58 and PS142 concentration hDMPK signal-dependent. PS58为结合于靶mRNA后不能激活RNA酶H的完全修饰的2' 0-甲基硫代磷酸酯寡核苷酸，在浓度低于DNA硫代磷酸酯寡核苷酸PS142约3000倍时有效。 PS58 when binding to the target mRNA RNA does not activate the RNase H of fully modified 2 'O-methyl phosphorothioate oligonucleotides, the DNA concentration is less than phosphorothioate oligonucleotides PS142 about 3000 times the effective . 来自患有亨廷顿病的男性患者的成纤维细胞（GM 00305)获自Coriell细胞库(Coriell Cell Repository) (Camden,New Jersey,US)并且根据所附的使用说明书和本领域技术人员已知的标准技术培养。  from a male patient with Huntington's Disease Fibroblasts (GM 00305) were obtained from Coriell Cell Repositories (Coriell Cell Repository) (Camden, New Jersey, US) and configured according to the accompanying instructions for use and the skilled person standard techniques known in the culture. 亨廷顿病患者携带一个健康的和一个导致疾病的亨廷顿基因等位基因，分别导致有正常数量的和扩大数量的（CAG)重复的两种mRNA表达。 Huntington patients carry one healthy and one disease-causing Huntington's gene alleles, respectively, resulting in a number of normal and expanded the number of repeats (CAG) both mRNA expression. 对照成纤维细胞（PAFCl)获自在两个亨廷顿等位基因中有正常重复长度的健康志愿者。 Control fibroblasts (PAFCl) were obtained from two healthy volunteers Huntington normal alleles repeat length. 以均针对亨廷顿转录本的互补三联体重复（CAG)的寡核苷酸PS57、PS261、PS262、 PS277和PS278转染所述成纤维细胞。  In complementary triplet is repeated for Huntington transcript (CAG) oligonucleotide PS57, PS261, PS262, PS277 and PS278 fibroblasts transfected with the. 按生产商的说明，使用PEI以几种浓度水平进行转染。 According to the manufacturer's instructions, using PEI transfection in several levels. 处理开始后4小时，清洗所述细胞并且应用新鲜培养基。 4 hours after the start, and the cells are washed with fresh medium. 转染开始后24小时或28小时，收获所述细胞，分离总RNA并且通过RT-PCR进行分析。 Beginning 24 hours after transfection or 28 hours, the cells were harvested, total RNA was isolated and analyzed by RT-PCR. 在55°C使用随机六聚物实施逆转录。 Reverse transcription using random hexamers at 55 ° C. 使用侧翼连接于外显子1中的重复扩增区的引物（正向：5'ATGGCGACCCTGGAAAAGCTG3'和5' TGAGGCAGCAGCGGCTGT 3')测定亨廷顿转录本。 Use flanking exon 1 primer repeat expansion region (Forward: 5'ATGGCGACCCTGGAAAAGCTG3 'and 5' TGAGGCAGCAGCGGCTGT 3 ') Huntington transcript was measured. 这种方法检测两种类型的亨延顿mRNA，正常的和具有额外（CAG)扩增的突变转录本，其可以通过2%琼脂糖电泳分离分析用于进行定性评价或通过Agilent2100生物分析仪或Caliper LabChip90进行定量。 Huntington mRNA This method detects two types, normal and mutant has an additional (CAG) amplified transcripts, which may be separated by 2% agarose gel electrophoresis for qualitative evaluation or analysis by Bioanalyzer or Agilent2100 Caliper LabChip90 quantify. 突变转录本的RT-PCR产物的定量结果相对于正常转录本的RT-PCR产物表示，并且表示为来自相同患者成纤维细胞的空载对照处理（没有寡核苷酸）（设为100% )的百分比。 Mutant transcripts quantitative results of the RT-PCR product relative to the RT-PCR product represents the normal transcript and expressed from the same patient is treated fibroblasts into idling control (no oligonucleotide) (set to 100%) percentage. 图2-7示出实验的结果。  FIG. 2-7 shows the results of the experiment. 图1-3显示均特异性针对重复序列的三种不同寡核苷酸， (CUG) 7、（UCG) 7或（CIG) 7，能够有效地抑制具有扩增（CAG)重复的突变亨廷顿转录本。 Figures 1-3 show three different oligonucleotides are specific for nucleotide repeats, (CUG) 7, (UCG) 7 or (CIG) 7, can be effectively suppressed with amplification (CAG) repeats mutant huntingtin transcript this. 这些化合物对具有高数目的致疾病的（CAG)重复的突变亨廷顿转录本比对携带较低数目的(CAG)重复的正常转录本更有效。 The compounds of transcripts (CAG) repeats having a high number of mutant huntingtin-induced diseases according to the normal transcription is more efficient than carrying on a lower number of (CAG) repeats. 这在源自亨廷顿病患者的GM00305细胞中得到证实，也在来自健康志愿者（PAFCl)的对照细胞中得以确认。 This is demonstrated in Huntington's disease patients from GM00305 cells, control cells are derived from healthy volunteers (PAFCl) in is confirmed. PCR产物经测序确认。 PCR products were confirmed by sequencing. 图5显示上述效应不但在4小时处理时段后的24小时存在，也在48小时后存在。 Figure 5 displays the effects not only in the 24 hours after treatment for 4 hours period exist, exist also after 48 hours. 这一较晚的时间点看起来比24小时更佳，因为在较低浓度已经出现明显抑制。 The later time point looks better than 24 hours, as it has significant inhibition at lower concentrations. 这些结果表明尽管处理时段短至4 小时，但效应可能会保持长得多的时段。 These results suggest that although the treatment period as short as four hours, but the effect is likely to remain much longer period of time. 最终，图7和8显示了两种嵌合的寡核苷酸的结果。  Finally, FIGS. 7 and 8 show the results of two chimeric oligonucleotide. 所述寡核苷酸的3'和5' 末端的核苷酸，而不是中心的10个核苷酸，以2' 0-甲基取代修饰，产生了所谓的间断体(gapmer)。 10 nucleotides' and 5 'terminal nucleotide of the oligonucleotide 3, rather than the center of a 2' O-methyl substituted modification produces a so-called intermittent member (gapmer). 对本领域技术人员而言，已知2' 0-甲基取代（或使用包括2' 0-甲氧基乙基或锁核酸的其他修饰）结合于靶mRNA后限制RNA酶H介导的降解。 To those skilled in the art, it is known 2 'O-methyl substituted (or 2 including' 0- methoxyethyl other modifications or locked nucleic acid) to limit binding RNA RNase H mediated degradation of the target mRNA. 这种RNA酶H介导的降解机制作为mRNA抑制手段可以通过维持寡核苷酸（“间断（thegap)”）中（硫代磷酸酯） DNA核苷酸的延伸保持。 RNA degradation mechanisms such as RNase H mediated mRNA suppressing means by maintaining an oligonucleotide ( "discontinuity (thegap)") in (phosphorothioate) DNA nucleotides extending retention. 然而图7和8中的结果清楚地表明完全修饰的PS57寡核苷酸有效得多，其应用寡核苷酸PS278或PS277抑制效果不明显或没有抑制效果的浓度有效地抑制了突变HD转录本水平。 However, the results of FIG. 8 and 7 clearly show that the PS57 fully modified oligonucleotides are much more effective, the application concentration of oligonucleotide PS278 or PS277 or no inhibiting effect is not obvious to effectively suppress the effect of suppressing the HD mutant transcripts Level. 根据实施例1描述的方法，源自DM500细胞的肌管用200nM寡核苷酸PS259 (与PS58相比具有可选择的起始核苷酸）或200nM寡核苷酸PS261(包含替代腺苷（A)的次黄嘌呤核苷（I)核苷酸）处理。  According to the method described in Example 1, the muscle cells derived from DM500 tube 200nM oligonucleotide PS259 (with an alternative starting nucleotide PS58 compared with), or 200nM oligonucleotide PS261 (comprising alternative gland glycoside (a), inosine (I) nucleotides) process. 图8显示的处理后hDMPK信号（实心柱）表明寡核苷酸的有效抑制。 Figure 8 shows processing after the hDMPK signal (solid bars) show effective inhibition of the oligonucleotide. 根据实施例1描述的方法，源自DM500细胞的肌管在用PEI (200nM寡核苷酸)或可选择地用脂质转染胺（lipofectamine)2·(根据生产商的使用说明书，使用50nM寡核苷酸）转染后用双链siRNA寡核苷酸组合PI-Ol或PI-02处理。  According to the method described in Example 1, myotubes derived from DM500 cells with PEI (200nM oligonucleotide) or alternatively with lipofectamine (lipofectamine) 2 · (according to manufacturer's instructions using using 50nM oligonucleotide) 02 PI-treated oligonucleotide combination PI-Ol or after transfection with siRNA duplexes. 寡核苷酸组合（siRNA)PI-Ol 或PI-02只与重复序列互补。 Combination of oligonucleotides (siRNA) PI-Ol or PI-02 only to repeat the sequence. 在处理孵育时段，进行两次转染操作。 In the process the incubation period, the transfection operation is performed twice. 图8显示的处理后hDMPK信号表明相对于PS58，siRNA寡核苷酸抑制的缺乏。 HDMPK signal after treatment showed Figure 8 shows the relative lack of PS58, siRNA oligonucleotide inhibition. 包含次黄嘌呤核苷和/或尿嘧啶和/或含有能形成摆动碱基对的碱基的核苷的寡核苷酸用于制备治疗或预防人类与顺式元件重复不稳定性相关的遗传病症的药物的用途，所述寡核苷酸包含只与基因转录本的重复序列互补的序列或由其组成。 It contains inosine and / or uracile and / or a nucleotide containing a wobble base capable of forming a base pair oligonucleotide for the preparation of treatment or prevention of a human cis-element repeat instability associated genetic medicament disorder, comprising only the oligonucleotide is complementary to a repeat sequence gene transcript or consists of a sequence. 2.如权利要求1所述的用途，其中所述包含次黄嘌呤核苷和/或尿嘧啶和/或含有能形成摆动碱基对的碱基的核苷的寡核苷酸是单链寡核苷酸。 2. The use according to claim 1, wherein the oligonucleotide comprising an inosine and / or uracile and / or a nucleotide containing a base able to form a wobble base pair oligonucleotides are single-stranded oligonucleotide nucleotides. 3.如权利要求1或2所述的用途，其中重复元件存在于所述基因转录本的编码或非编码序列。 Or use according to claim 12, wherein the repetitive element is present in the coding or non-coding sequence of the gene transcript. 4.如上述权利要求中任一项所述的用途，其中所述寡核苷酸包含与选自（CAG)n、 (GCG) η、（CUG) η、（CGG) η、（CCG) η、（GAA) η、（GCC) η 和（CCUG) η 的重复元件互补的序列或由其组成。 4. The use of any one of (CCG) η of the preceding claims, wherein said selected oligonucleotide comprises (CAG) n, (GCG) η, (CUG) η, (CGG) η, , (GAA) η, (GCC) η and (CCUG) [eta] of the repeating element consists of or a sequence complementary. 5.如上述权利要求中任一项所述的用途，其中所述寡核苷酸的长度为约9至约50个核苷酸，优选地为12-40个核苷酸，更优选地为15-30个。 5. The use of any preceding claim preceding claim, wherein the length of the oligonucleotide is from about 9 to about 50 nucleotides, preferably 12-40 nucleotides, more preferably 15-30. 6.如上述权利要求中任一项所述的用途，其中所述寡核苷酸包含下列或由下列组成： 有或没有包含硫代磷酸酯的主链的RNA核苷酸、DNA核苷酸、锁核酸（LNA)核苷酸、肽核酸(PNA)核苷酸、吗啡啉磷酰二胺、乙烯桥核酸（ENA)核苷酸或其混合物。 6. The use of any one of the preceding claims, wherein the oligonucleotide comprises or consists of the following: an RNA comprising a nucleotide or without a phosphorothioate backbone, the DNA nucleotides , locked nucleic acid (LNA) nucleotides, peptide nucleic acids (PNA) nucleotides, morpholino phosphorodiamidate, ethylene-bridged nucleic acid (ENA) nucleotides or mixtures thereof. 7.如权利要求6所述的用途，其中所述寡核苷酸包含2' -0-取代的RNA硫代磷酸酯核苷酸，优选地，其中所述2' -0-取代是甲氧基乙基和/或甲基和/或2' 0，4' C亚甲基桥(LNA)和/或2'0，4'C约束的乙烯基(cEt)和/或2'0，4'C约束的甲氧基乙烯基(cMOEt)。 7. The use according to claim 6, wherein the oligonucleotide comprising a 2 '-0- substituted RNA phosphorothioate nucleotides, preferably wherein the 2' substituent is methoxy -0- ethyl and / or methyl and / or 2 '0,4' C methylene bridge (LNA) and / or vinyl 2'0,4'C constraints (cEt) and / or 2'0,4 'C constraint methoxyvinyl (cMOEt). 8.如上述权利要求中任一项所述的用途，其中所述寡核苷酸包含只与基因转录本的重复序列互补的序列或由其组成，用于制备治疗或预防人类与顺式元件重复不稳定性相关的遗传病症的药物，并且其中所述寡核苷酸是RNA酶H基本上非依赖的寡核苷酸，以及优选地，其中所述寡核苷酸的长度为9-50个核苷酸，并在其5'或3'末端的至少一个被如权利要求6所定义的取代，并且在其序列的其余部分包含少于9个，更优选地少于6个连续的脱氧核糖。 8. The use of any one of the preceding claims, wherein said oligonucleotide comprises a sequence complementary to a repeat sequence present only the gene transcript or consist of, treatment or prevention of a human for the preparation of cis-elements repeat drug instability associated genetic disorders, and wherein said oligonucleotide is a RNAse H substantially independent RNA oligonucleotides, and preferably, wherein the length of the oligonucleotide is 9-50 nucleotides, and the 5 'or 3' end as claimed in at least one defined in claim 6 substituents, and comprises less than 9 in which the rest of the sequence, more preferably less than 6 consecutive deoxy ribose. 9.如权利要求8所述的用途，其中所述寡核苷酸不包含脱氧核糖并且所述主链被如权利要求6所定义的完全修饰。 9. The use according to claim 8, wherein the oligonucleotide does not comprise deoxyribonucleotides and the backbone is fully modified as defined in claim 6. 10.如上述权利要求中任一项所述的用途，其中所述药物中的寡核苷酸通过能够使所述寡核苷酸表达的核酸载体提供和/或其中所述药物中的寡核苷酸被提供有至少一种赋形剂和/或用于将所述寡核苷酸递送至细胞和/或增强其细胞内递送的靶向配体。 10. The use of any one of the preceding claims, wherein the medicament by an oligonucleotide said oligonucleotide capable of expression vector provides a nucleic acid and / or wherein said medicament oligonucleotide nucleotide is provided with at least one excipient and / or for the delivery of oligonucleotides to cells and / or enhancing its intracellular delivery targeting ligand. 11.包含次黄嘌呤核苷和/或尿嘧啶和/或含有能形成摆动碱基对的碱基的核苷的寡核苷酸，其中所述寡核苷酸包含与选自(CAG)n、(GCG) n、（CUG) η、（CGG) η、（CCG) η、（GAA) η、 (GCC)n和（CCUG)n的重复序列互补的序列或由其组成，并且长度为9-50个核苷酸。 11. The oligonucleotide comprising an inosine and / or uracile and / or a nucleotide containing a wobble base capable of forming a base pair oligonucleotide, wherein said oligonucleotide is selected from the group comprising (CAG) n , (GCG) n, (CUG) η, (CGG) η, (CCG) η, (GAA) η, (GCC) n repeat sequence complementary to and (CCUG) n sequences or consist of, and a length of 9 -50 nucleotides. 12.优选如权利要求11所述的寡核苷酸，其包含与选自（CAG)n、(GCG)n、（CUG)ru(CGG) η、(CCG)η, (GAA)η, (GCC)n和（CCUG)η的重复序列互补的序列或由其组成，长度为9_50个核苷酸，以及其中所述寡核苷酸是RNA酶H基本上非依赖的寡核苷酸。 12. 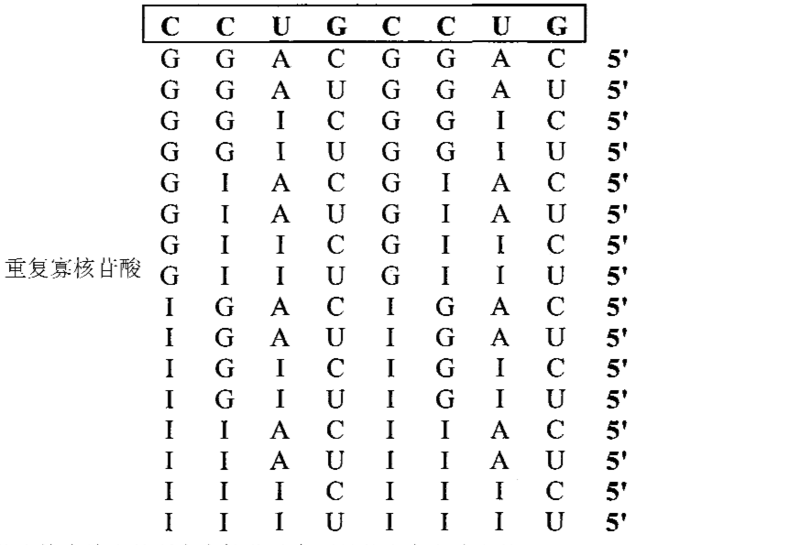 The preferred oligonucleotide according to claim 11, selected from the group which comprises (CAG) n, (GCG) n, (CUG) ru (CGG) η, (CCG) η, (GAA) η, ( GCC) n and (CCUG) η repeating sequence complementary or consist of, 9_50 nucleotides in length, and wherein said enzyme is an RNA oligonucleotide H substantially independent oligonucleotide. 13.如权利要求11或12所述的寡核苷酸，以及还如在权利要求1-10中任一权利要求所定义的，所述寡核苷酸优选被提供有放射性标记或荧光标记。 13. The oligonucleotide of claim 11 or claim 12, and further as provided in any one of claims 1 to 10 as defined in the claims, the oligonucleotide is preferably labeled with a radioactive or fluorescent label. 14.包含如权利要求11-13中任一权利要求定义的寡核苷酸的药学上可接受的组合物，其优选地还包含至少一种赋形剂和/或用于将所述寡核苷酸递送至细胞和/或增强其细胞内递送的靶向配体。 Pharmaceutically oligonucleotide comprising a pharmaceutical composition as claimed in 14 any one of claims 11 to 13 as defined in claim, which preferably further comprises at least one excipient and / or for the oligonucleotide nucleotide delivered to cells and / or enhancing its intracellular delivery targeting ligand. 15.核酸载体，优选为病毒载体，其能够使如权利要求11-13中任一权利要求定义的寡核苷酸在人细胞中表达。 15. A nucleic acid vector, preferably a viral vector, as claimed in claim which can be made in any one of claims 11-13 oligonucleotide as defined polynucleotide expression in human cells. 16.减少细胞中包含重复的基因转录本的体外方法，其包括给药如权利要求11-13中任一权利要求所定义的寡核苷酸或如权利要求14所定义的药学上可接受的组合物，或如权利要求15所定义的核酸载体。 16. A method of reducing the in vitro gene transcript contains duplicate cells, comprising the administration of an oligonucleotide as claimed in claim 14 or as defined in claim in any one of claims 11-13 pharmaceutically acceptable, as defined in the claims nucleic acid vector 15 defined composition, or as claimed in claim. 17.体外或离体检测和/或诊断方法，其中使用如权利要求11-13中任一权利要求所述的寡核苷酸。 17. The in vitro or ex vivo detection and / or diagnostic method, as claimed in claim wherein said oligonucleotide of any one of claims 11-13 nucleotides.